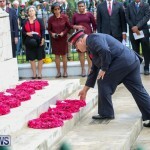 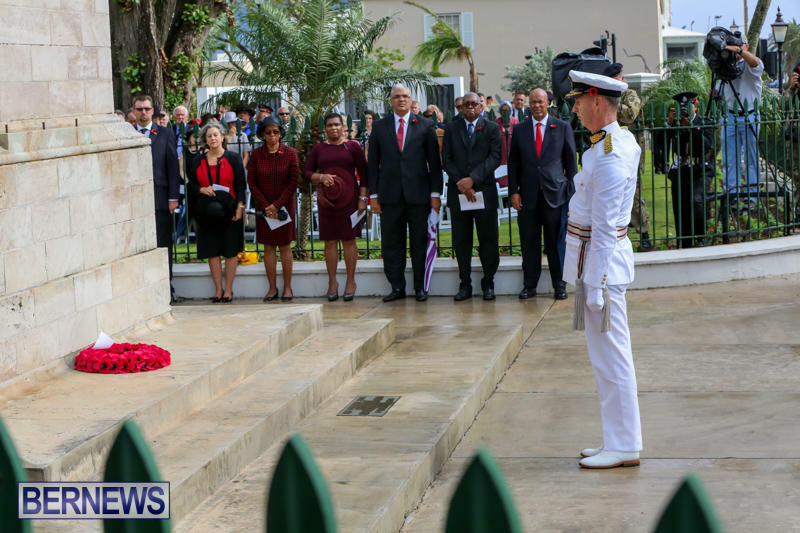 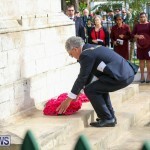 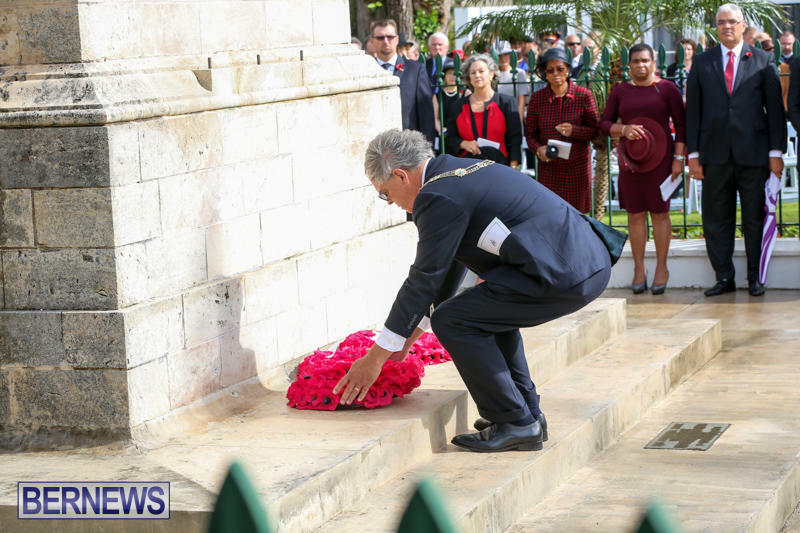 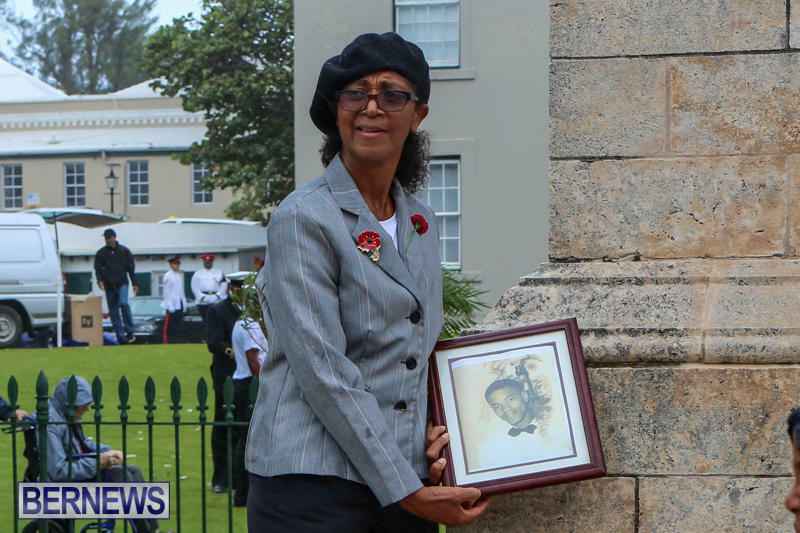 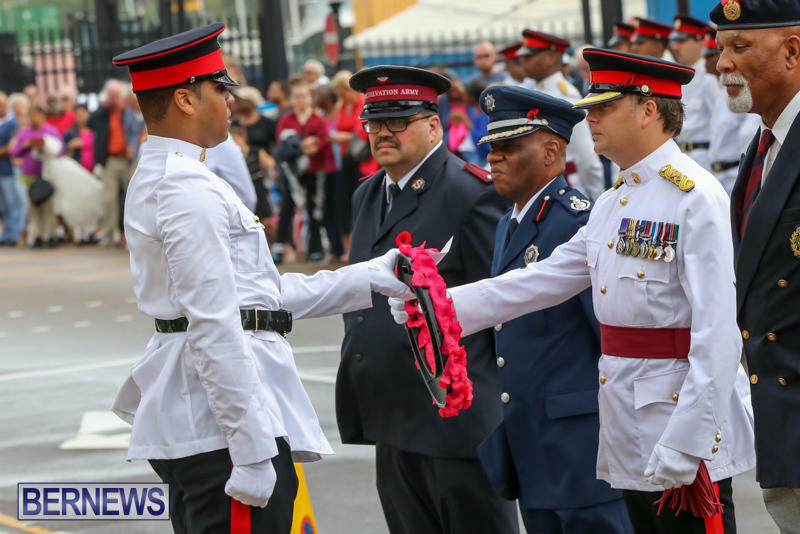 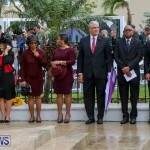 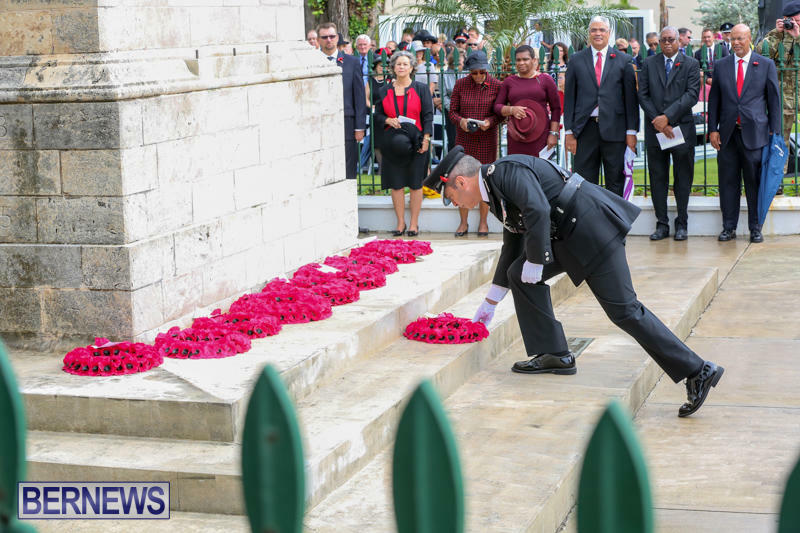 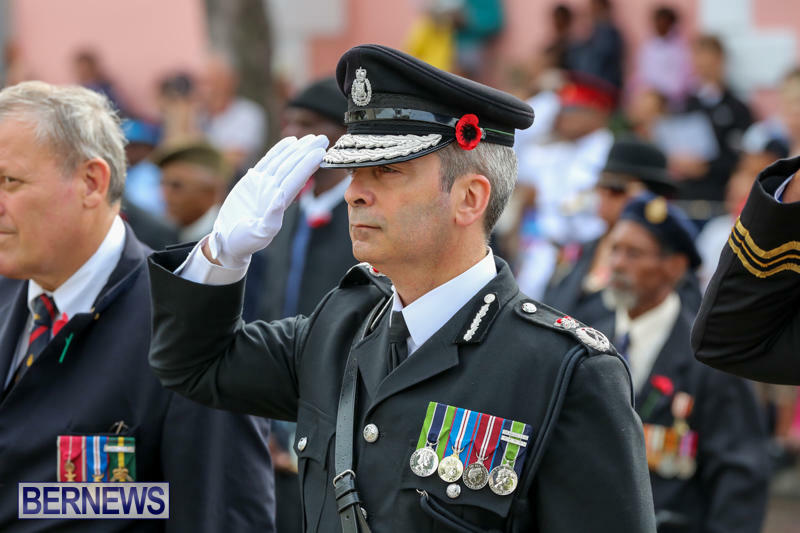 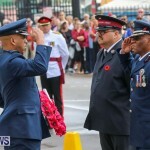 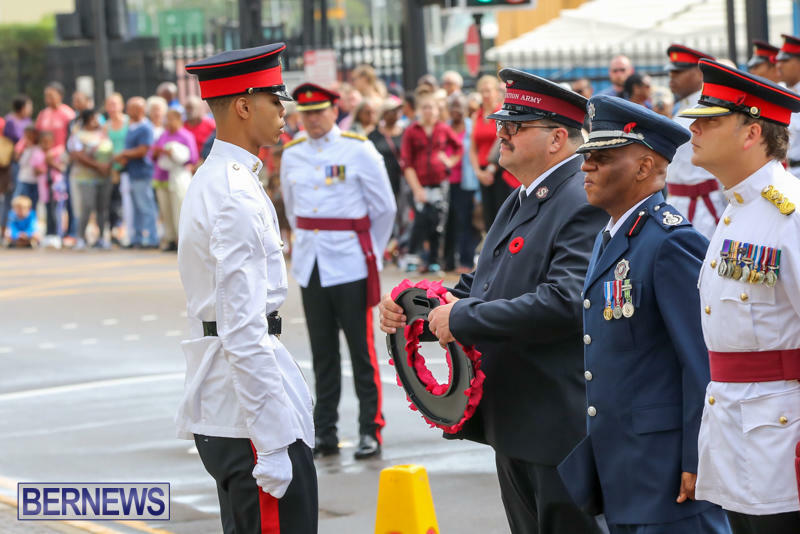 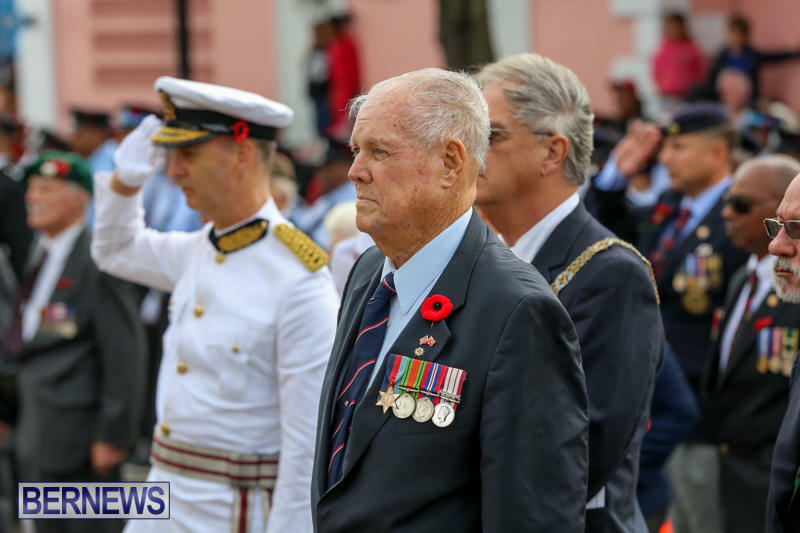 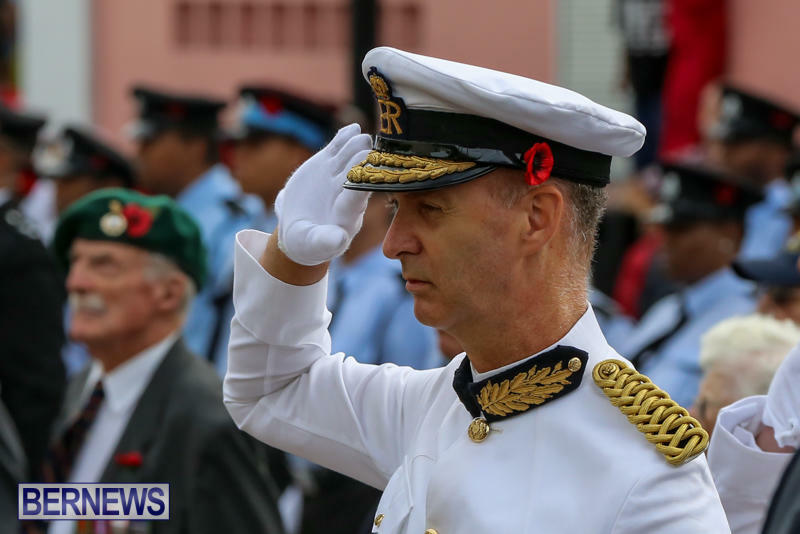 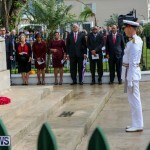 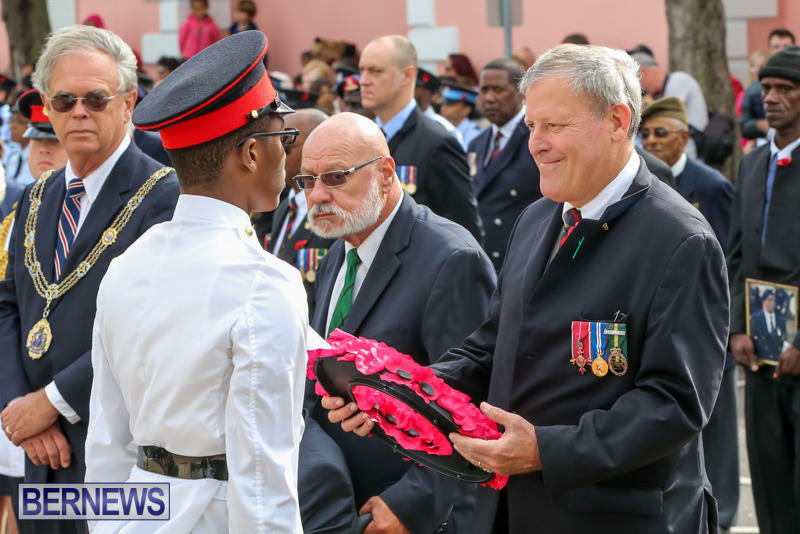 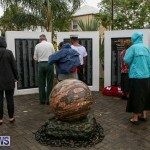 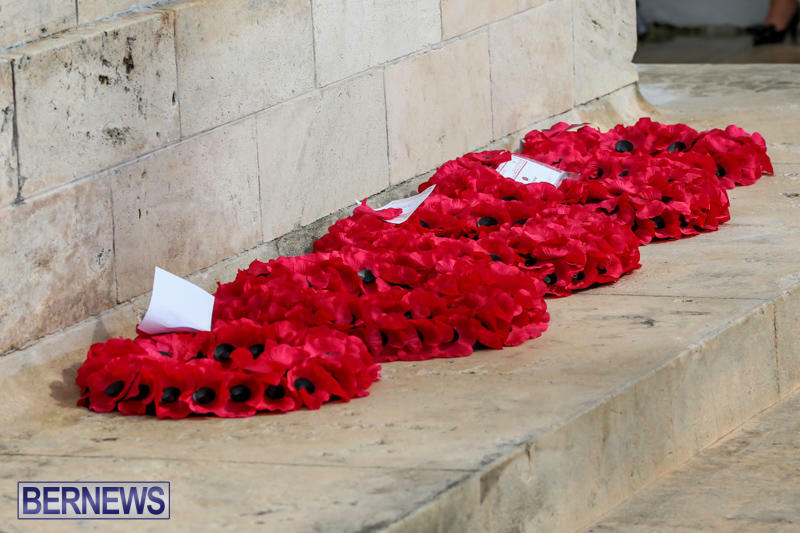 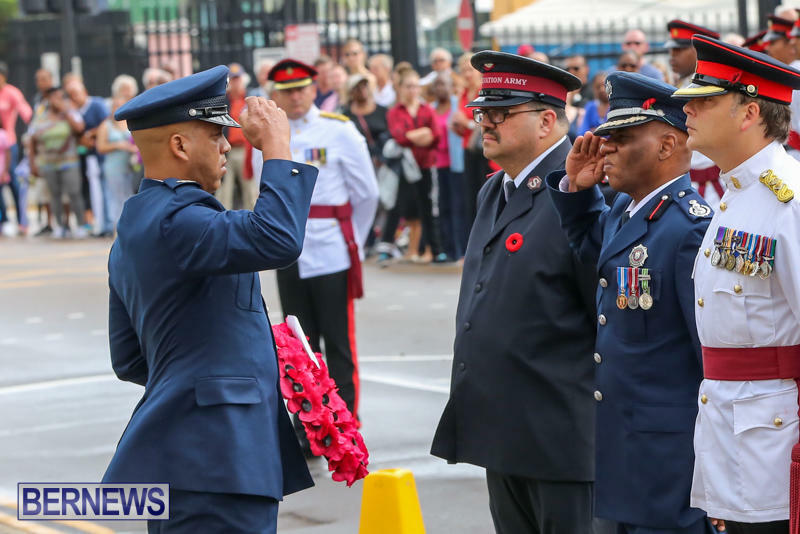 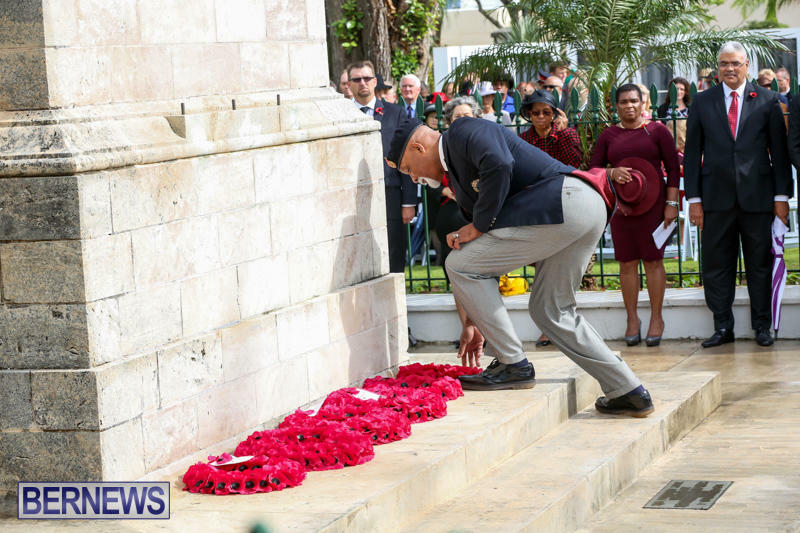 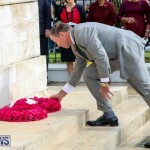 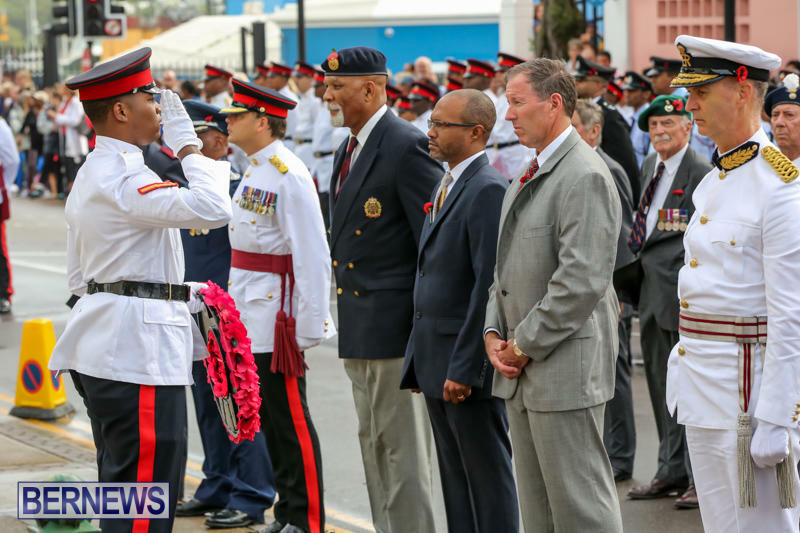 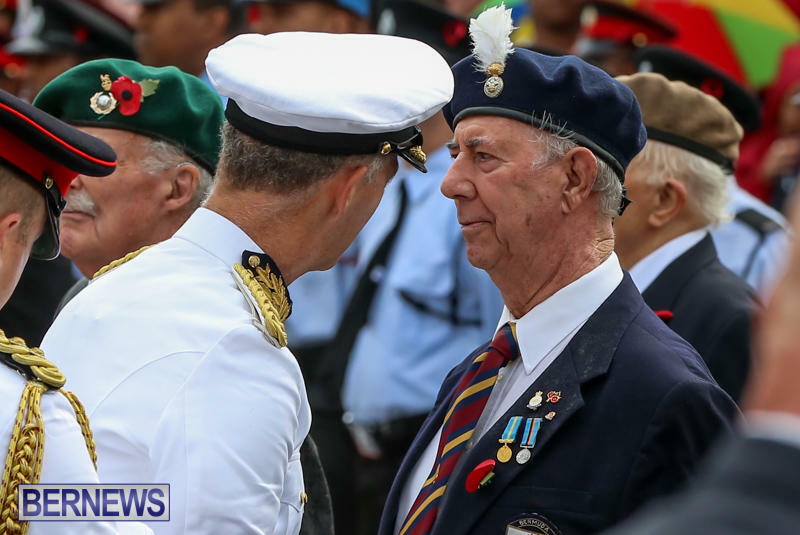 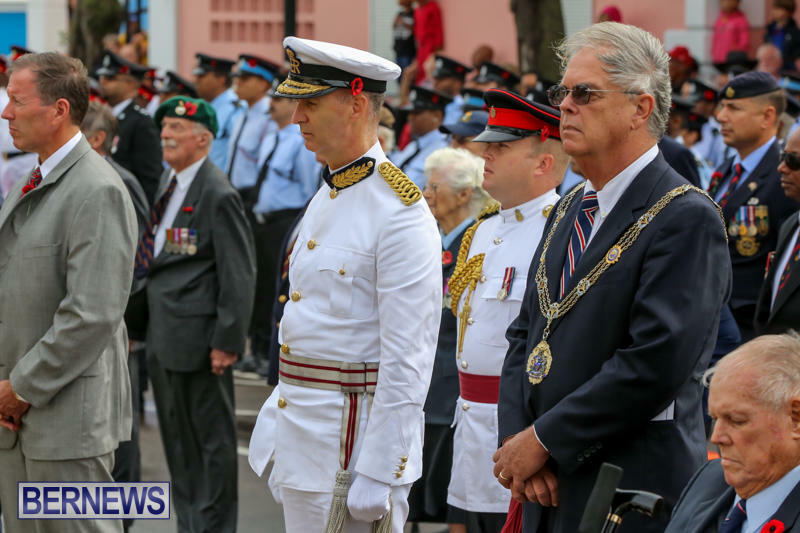 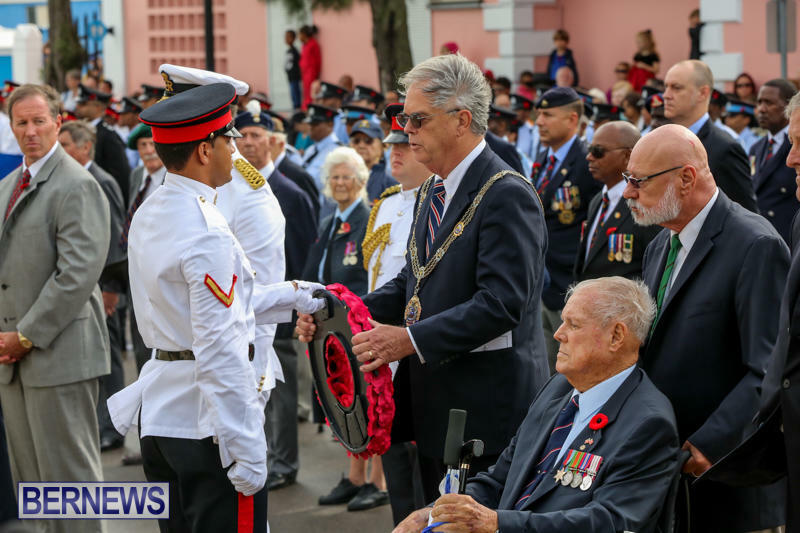 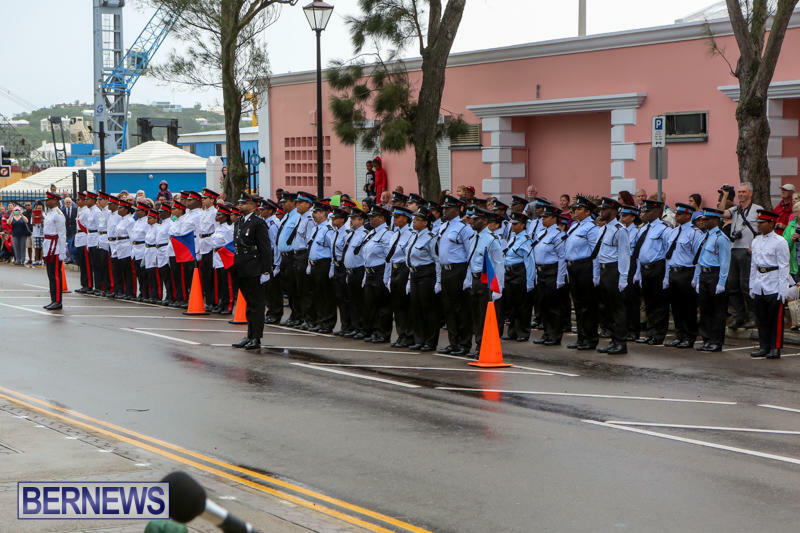 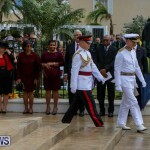 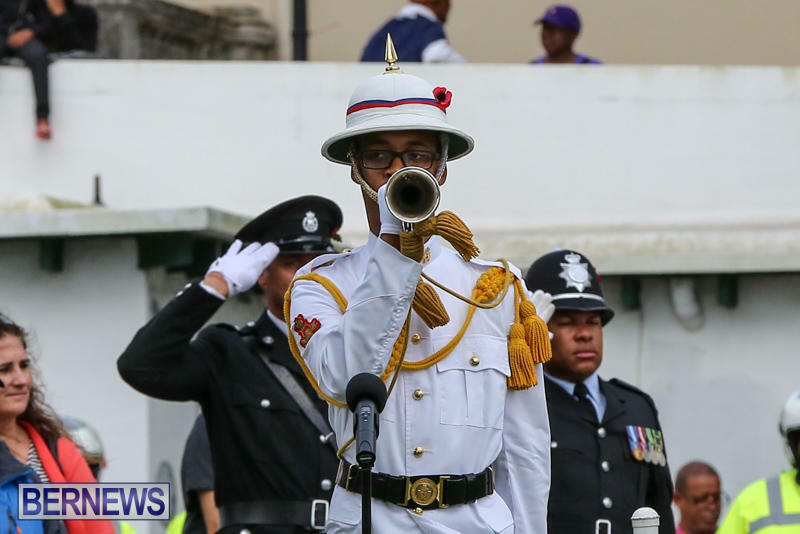 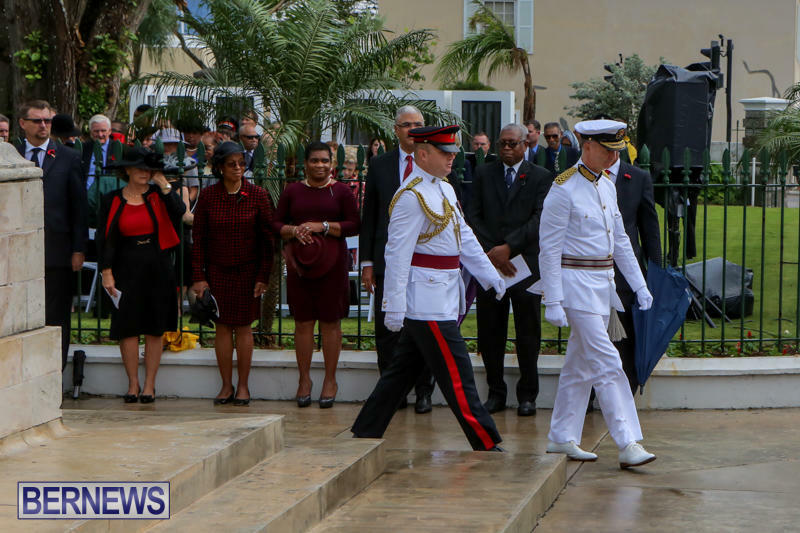 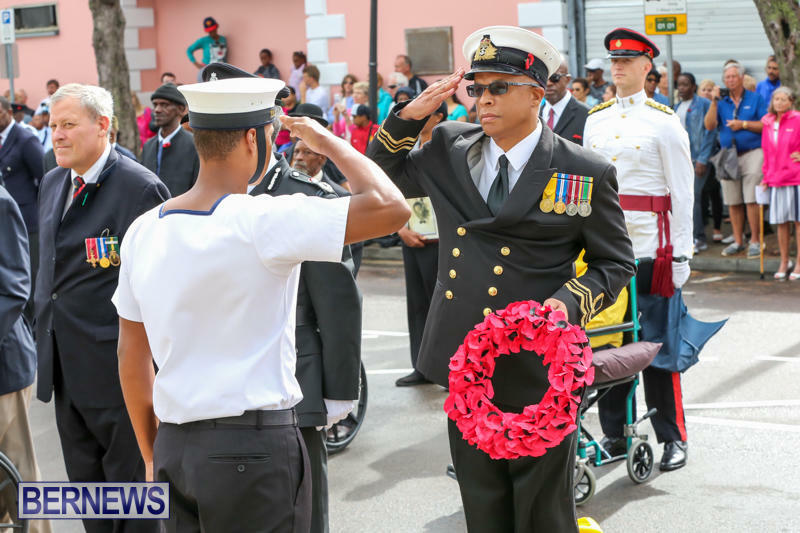 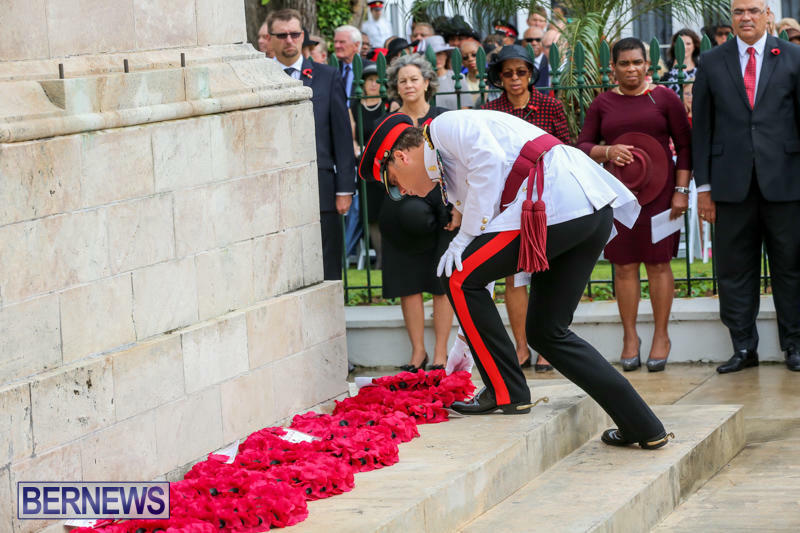 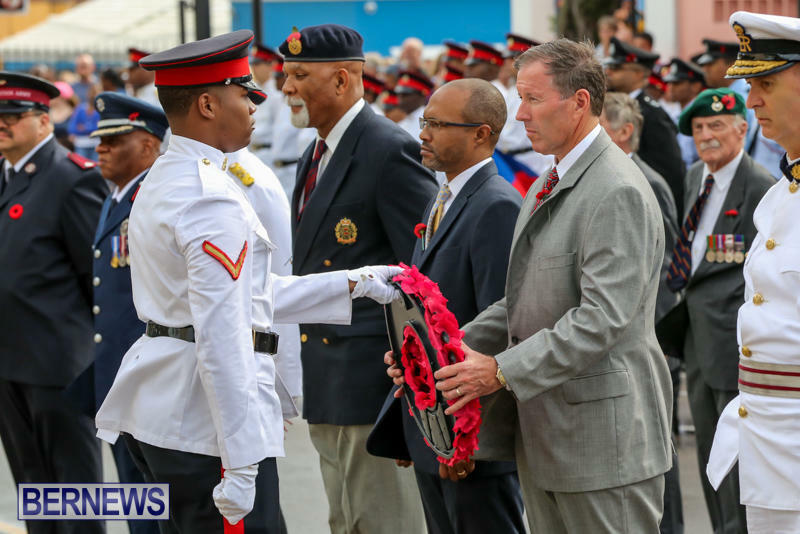 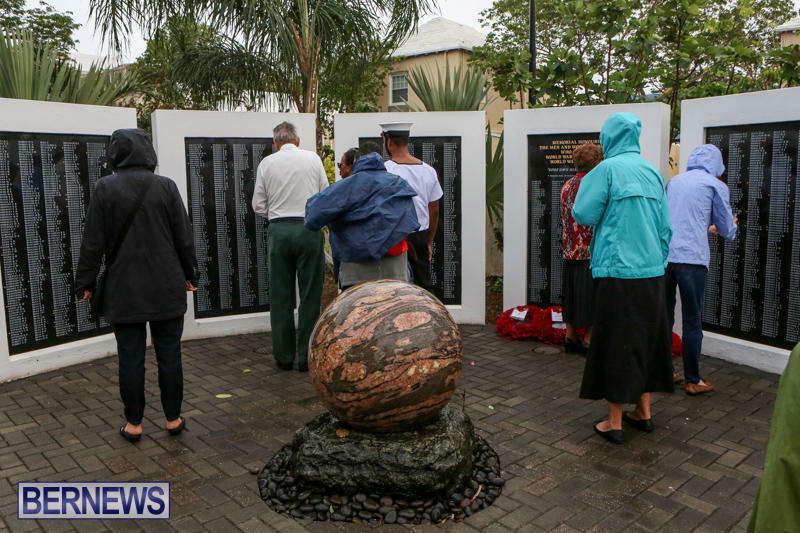 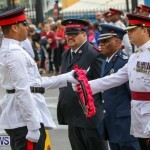 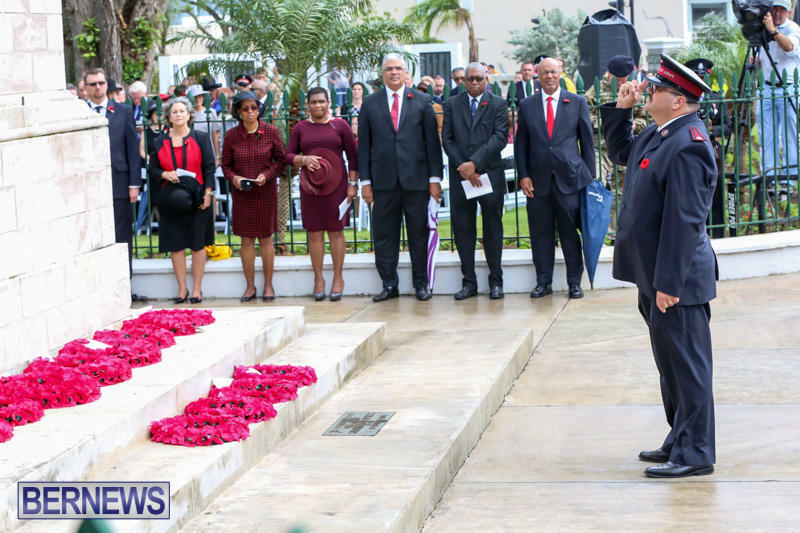 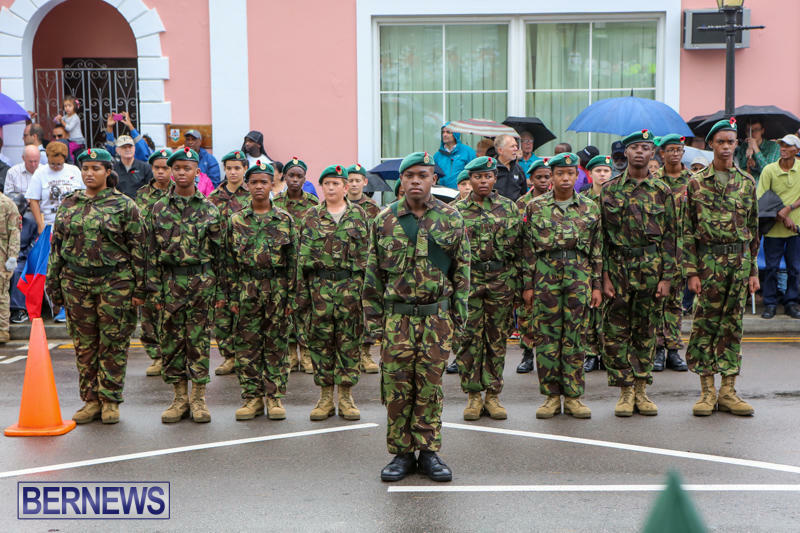 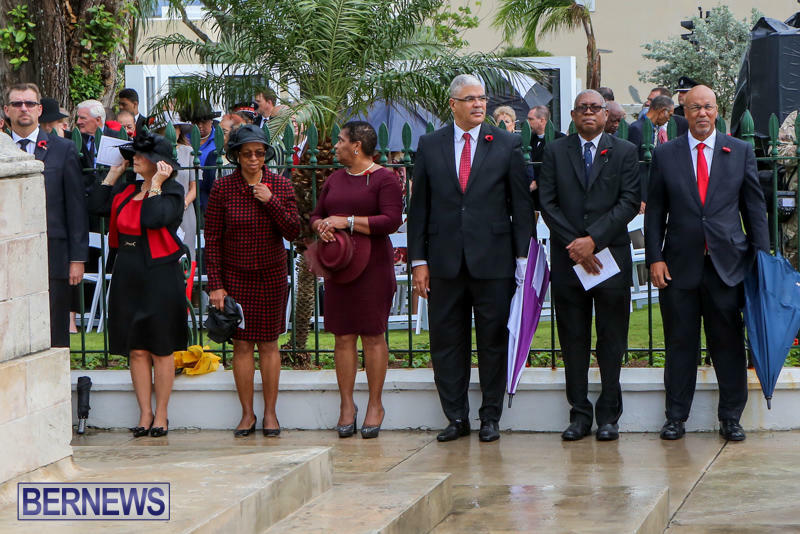 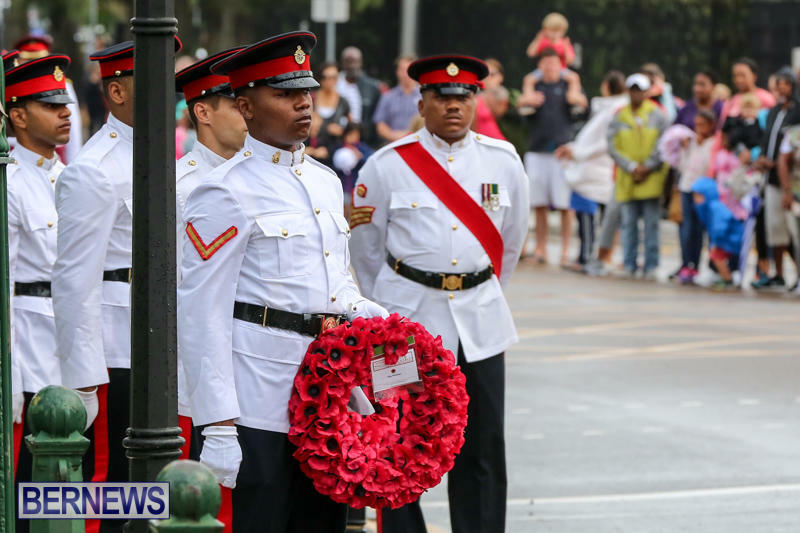 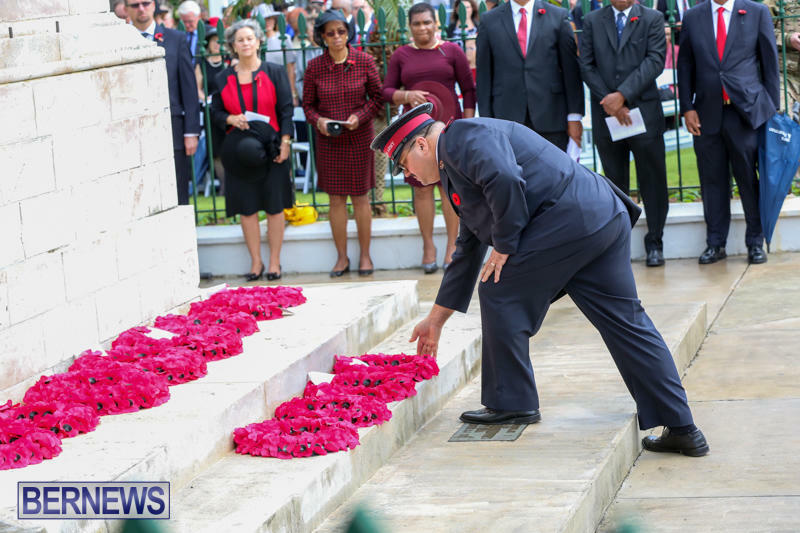 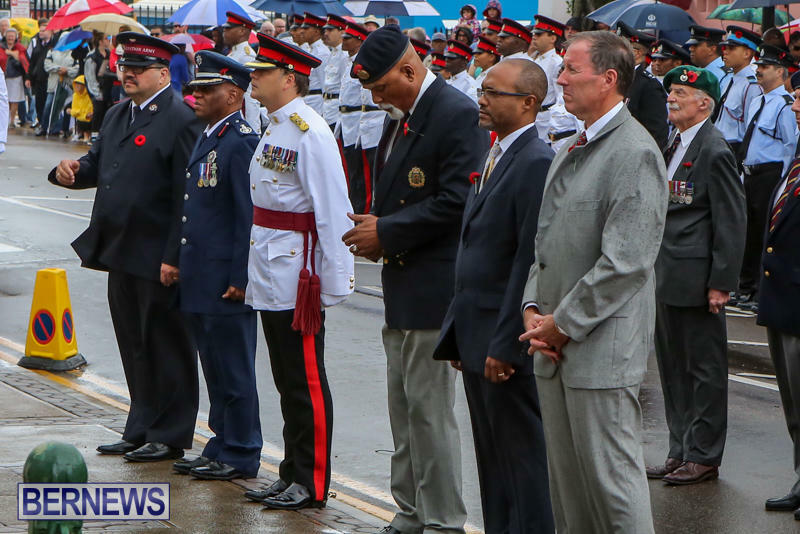 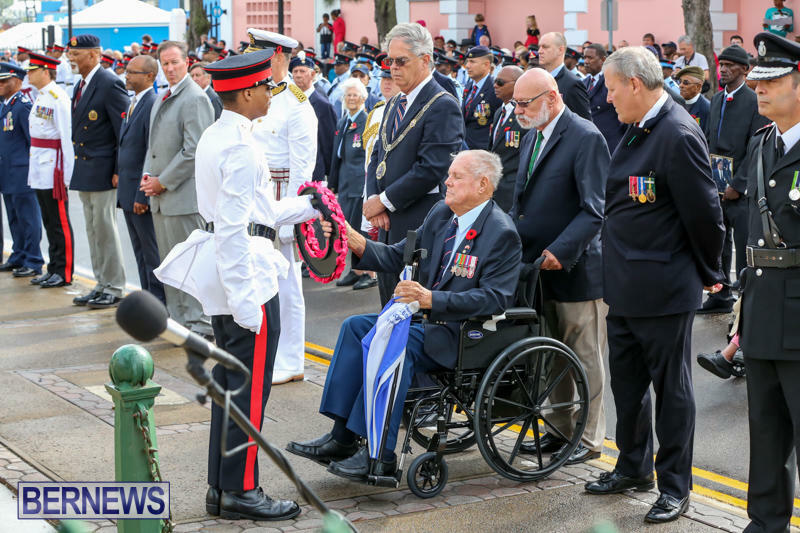 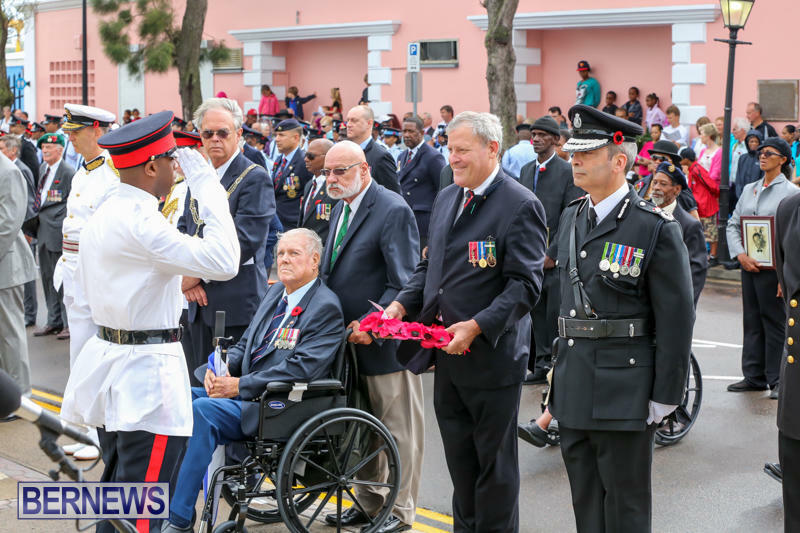 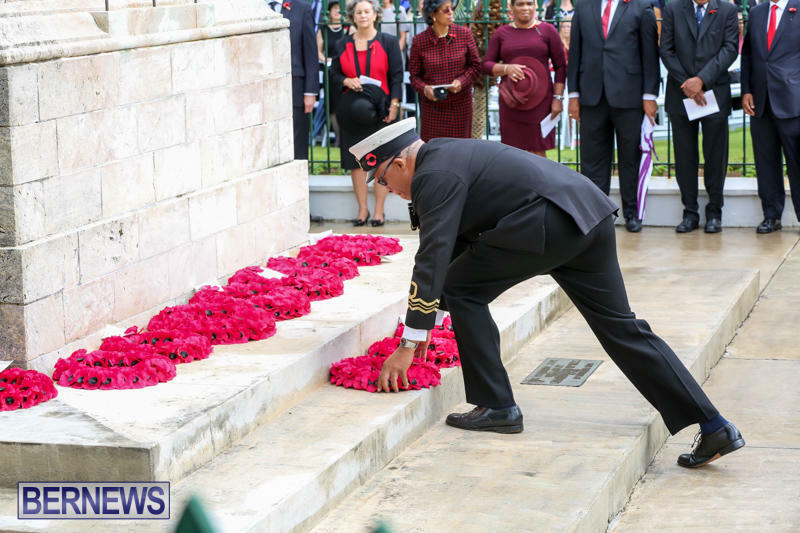 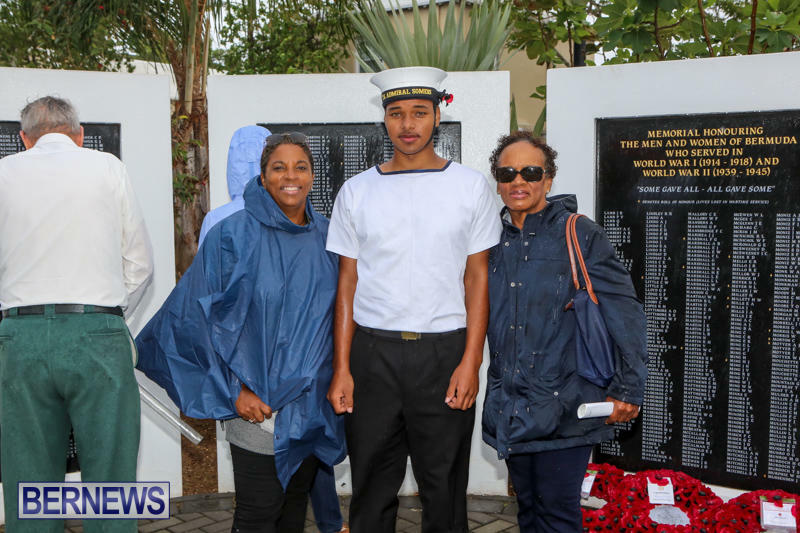 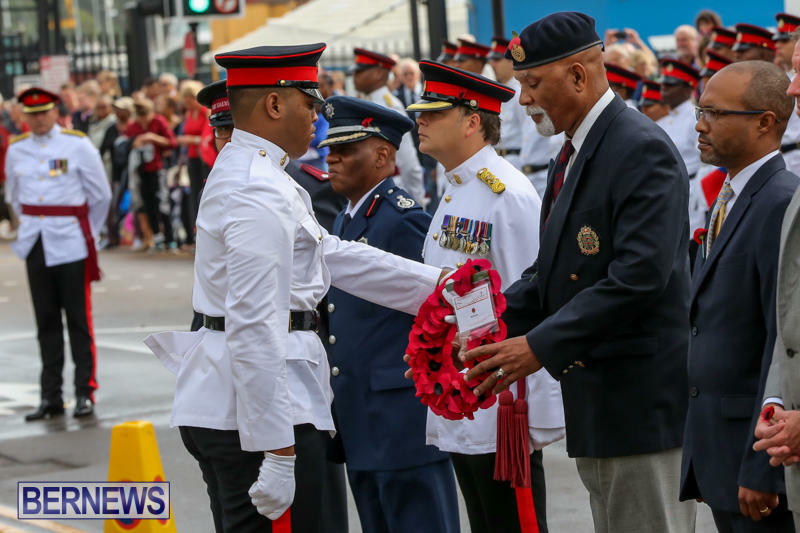 [Updated with video] Hamilton came to a standstill as the annual Remembrance Day parade marked two minutes’ silence to honour the fallen. 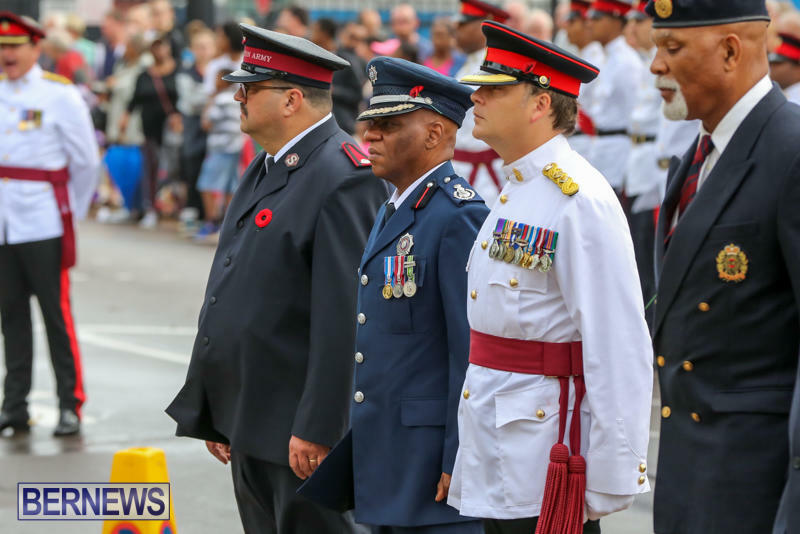 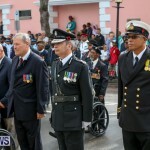 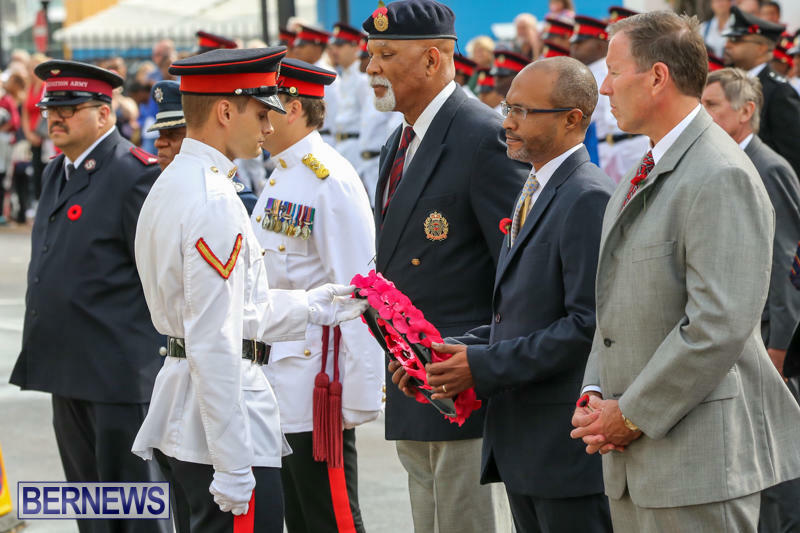 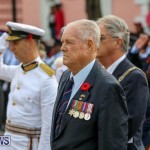 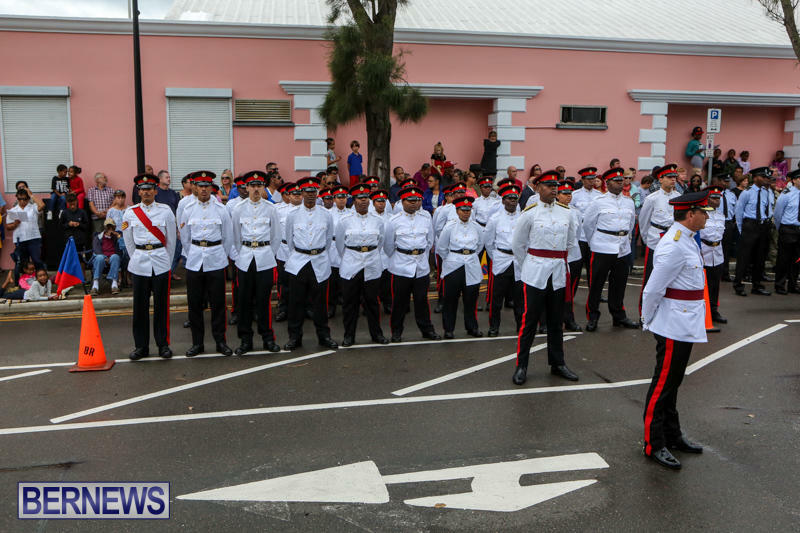 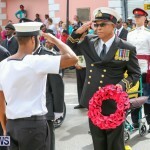 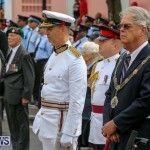 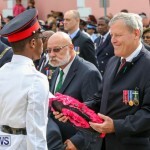 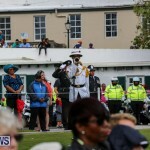 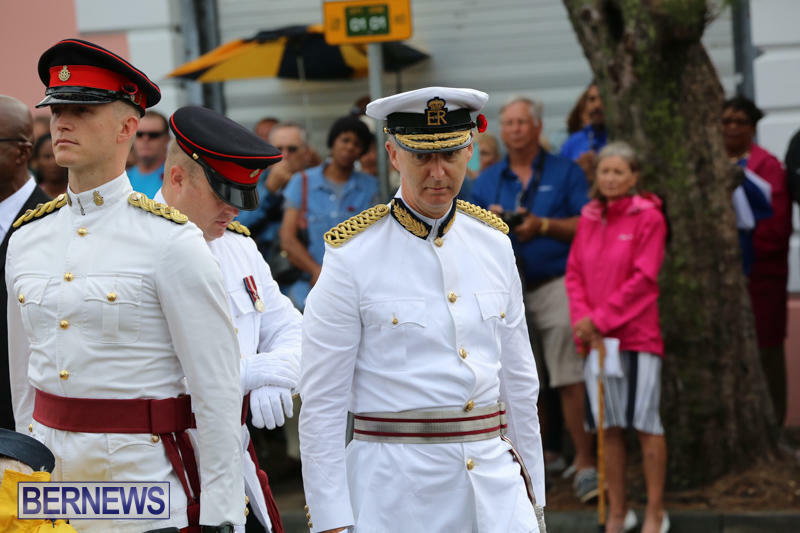 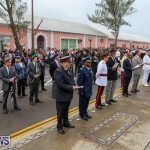 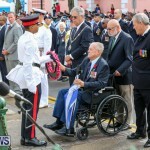 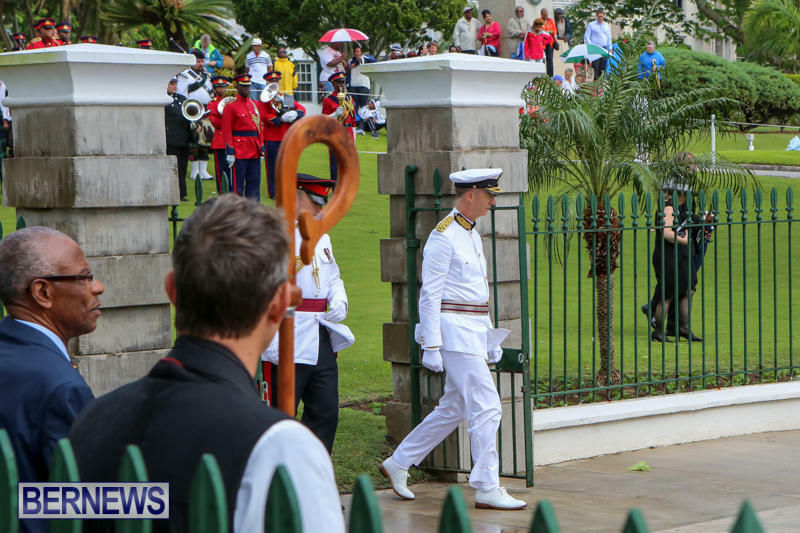 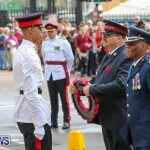 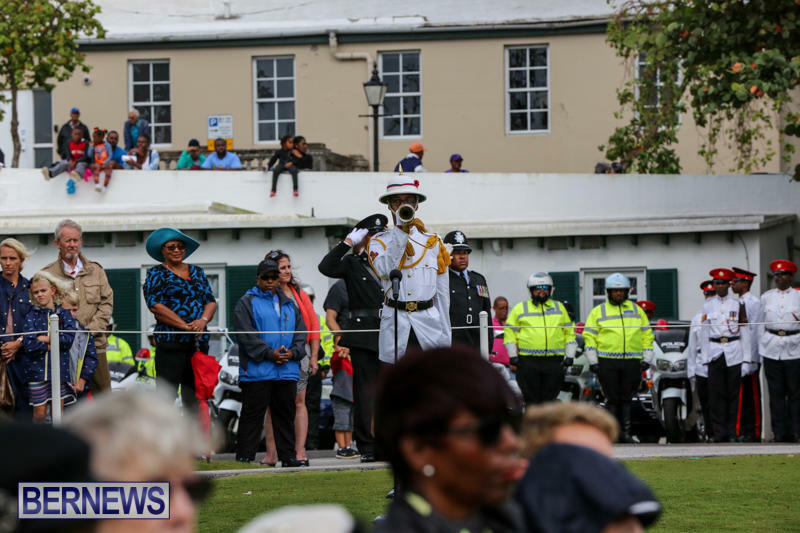 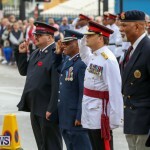 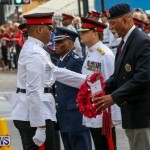 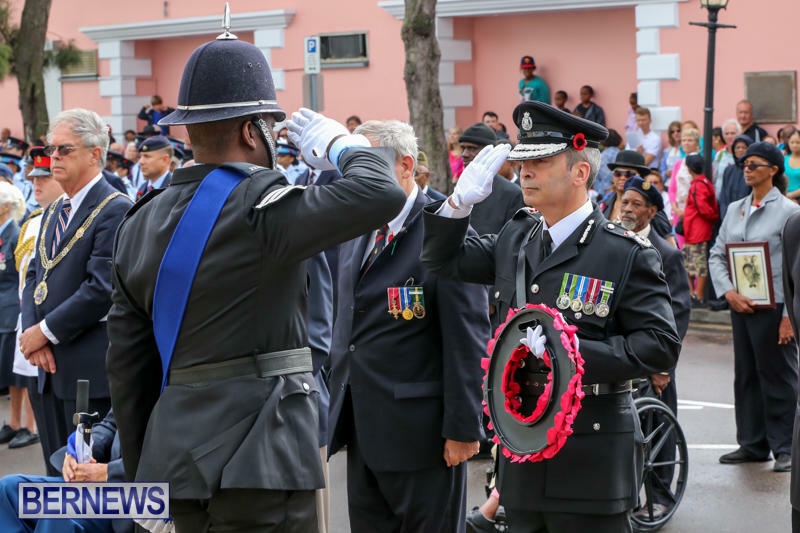 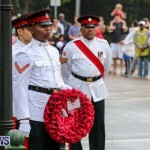 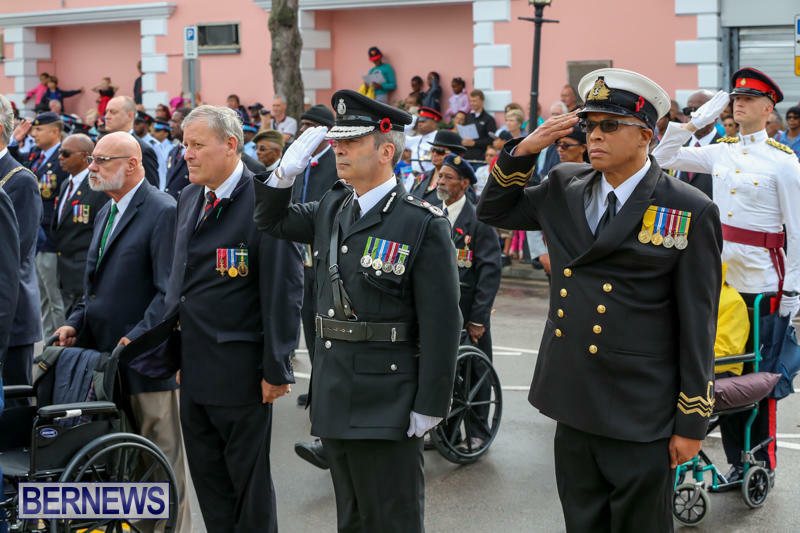 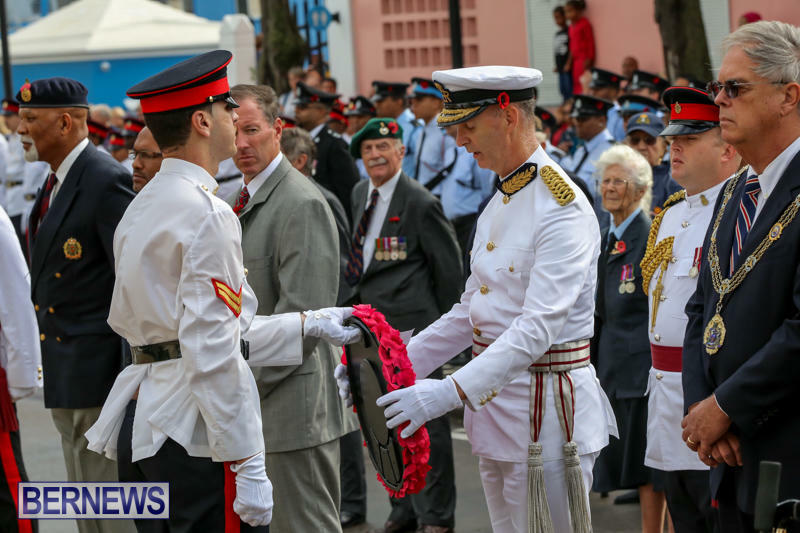 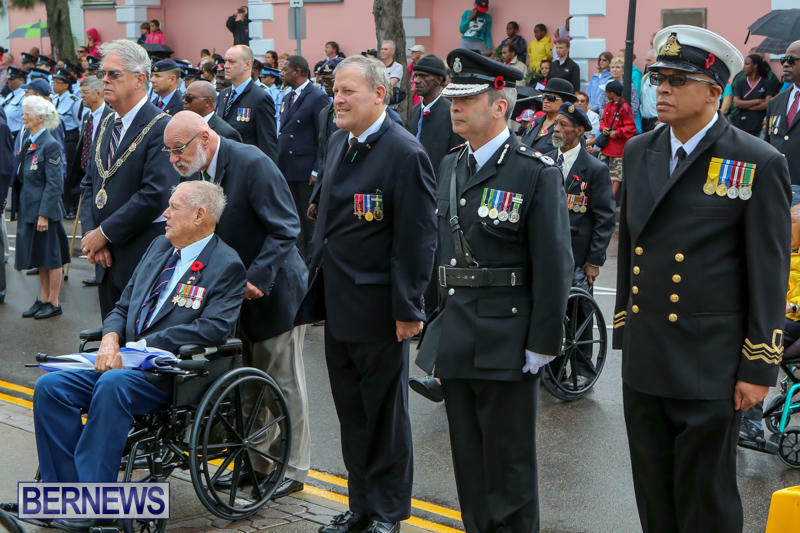 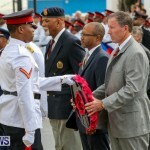 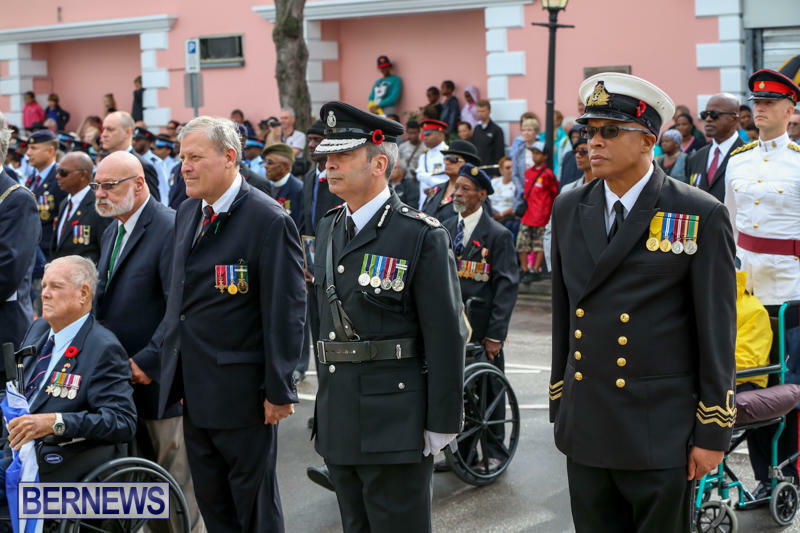 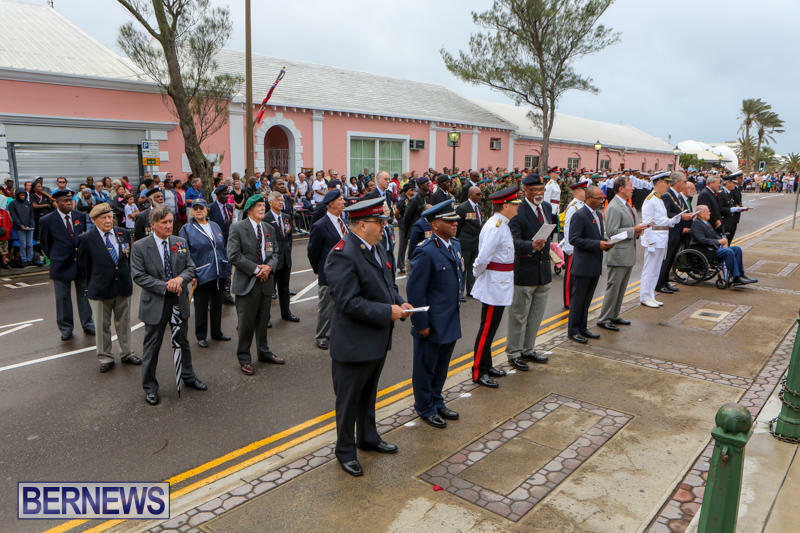 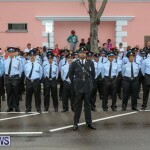 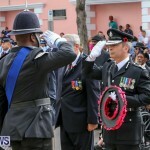 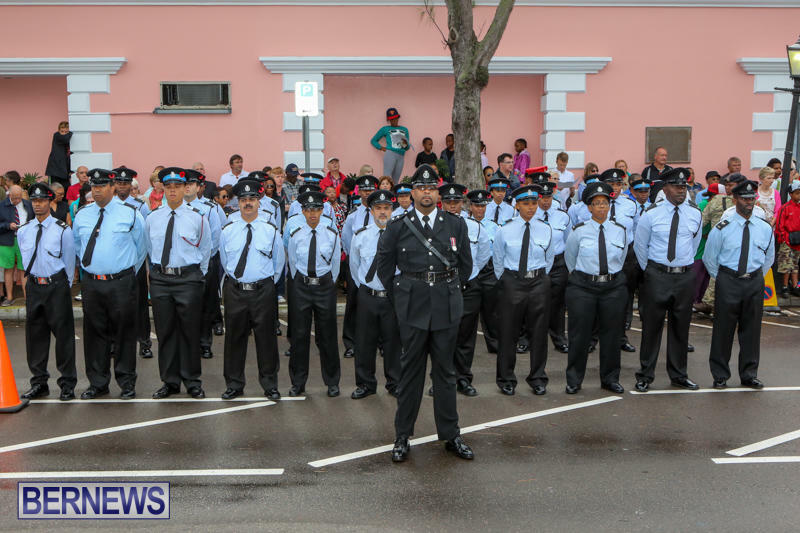 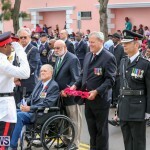 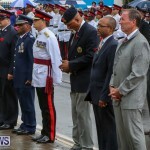 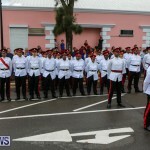 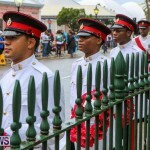 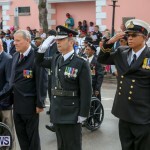 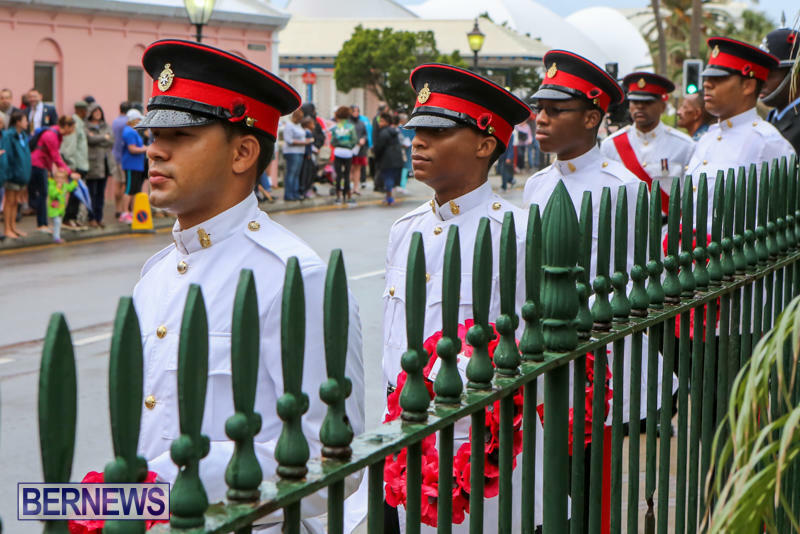 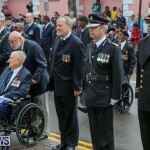 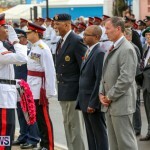 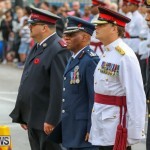 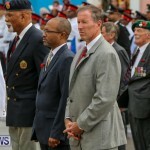 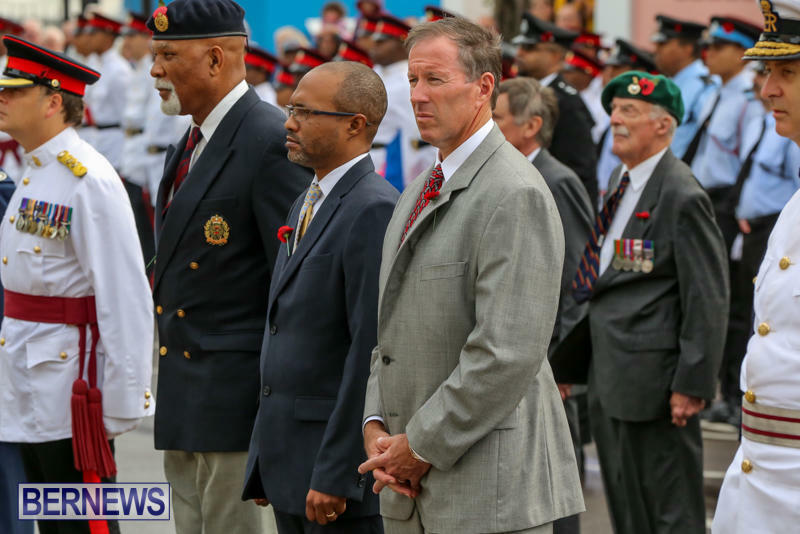 Veterans joined serving Royal Bermuda Regiment [RBR] soldiers and police on parade at the Cenotaph on Front Street today [Nov 11], while hundreds looked on. 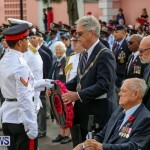 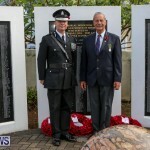 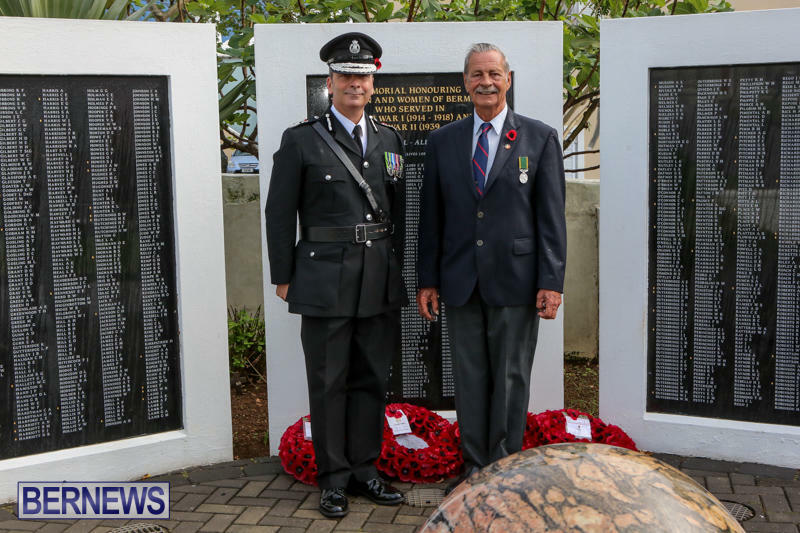 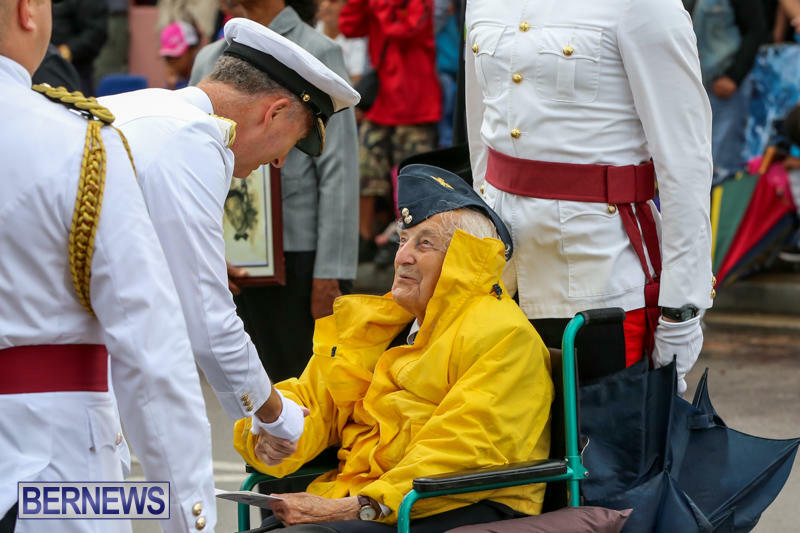 Allan Kuhn, 94, who served in World War II with the Canadian Army’s Grenadier Guards, paraded with other former soldiers as dignitaries, led by Governor George Fergusson, laid wreaths at the memorial. 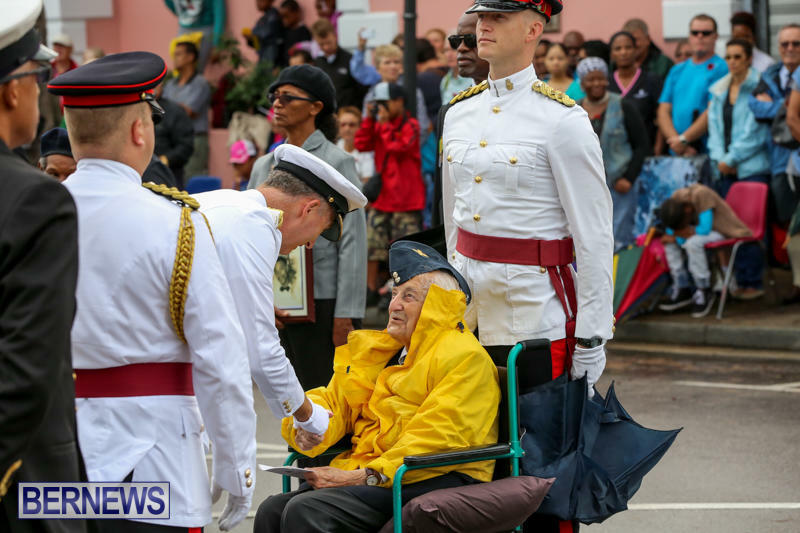 Anglican Canon Thomas Nisbett, 90, who served in the Bermuda Militia Infantry guarding military installations on the Island in World War II, added: “I never miss it. 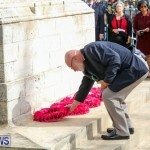 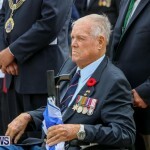 Vernon Clarke, a former regular soldier in the British Army’s Royal Engineers, who served in Europe at the height of the Cold War and did two tours of troubled Northern Ireland, said: “It’s vital to remember. 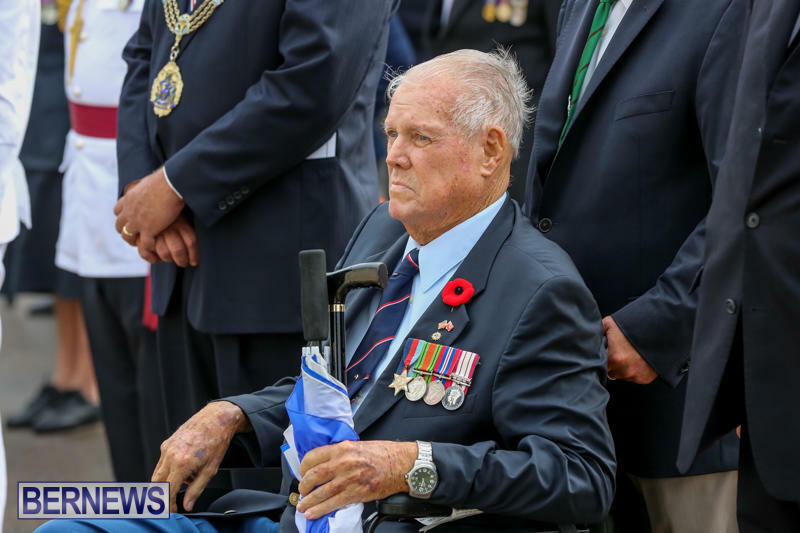 “When I was serving in Germany we went to some of the battlefields and I saw the graves. 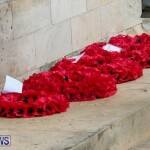 As far as the eye can see it was just graves. 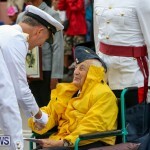 Chip Waters, a former Colonel in the US Army Rangers and a paratrooper, added: “I come every year. 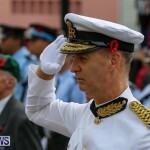 Col. 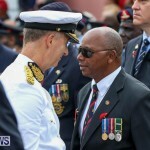 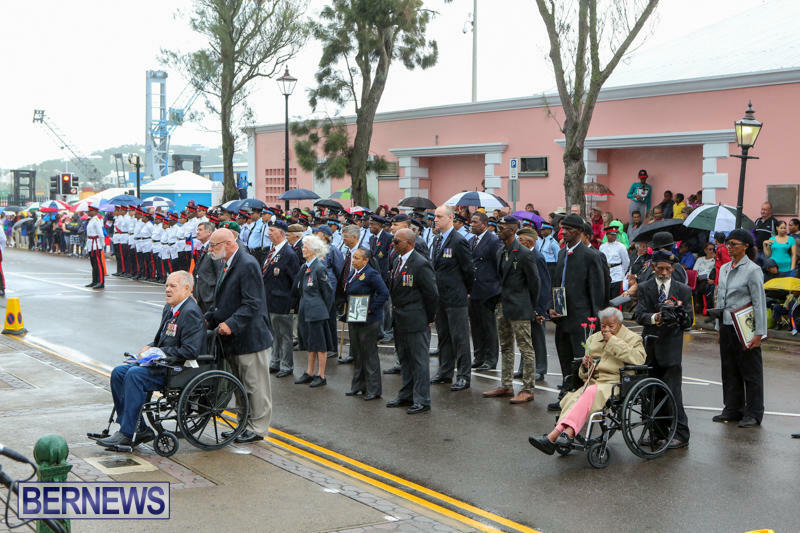 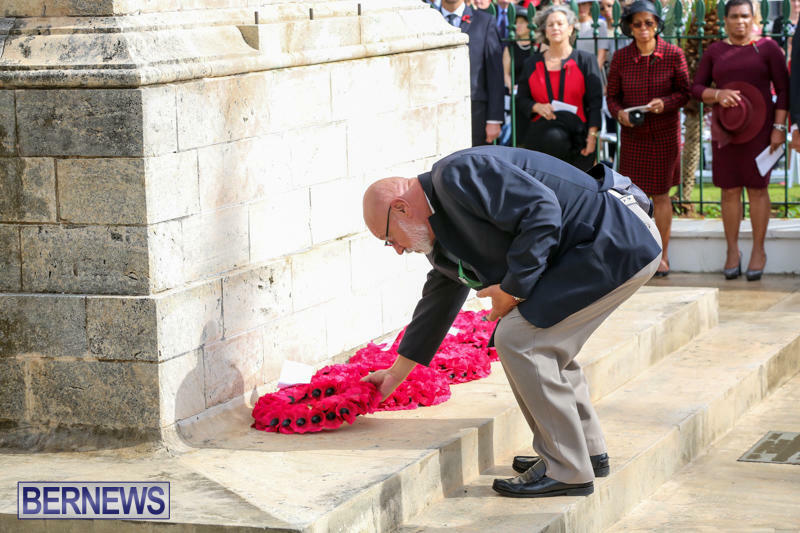 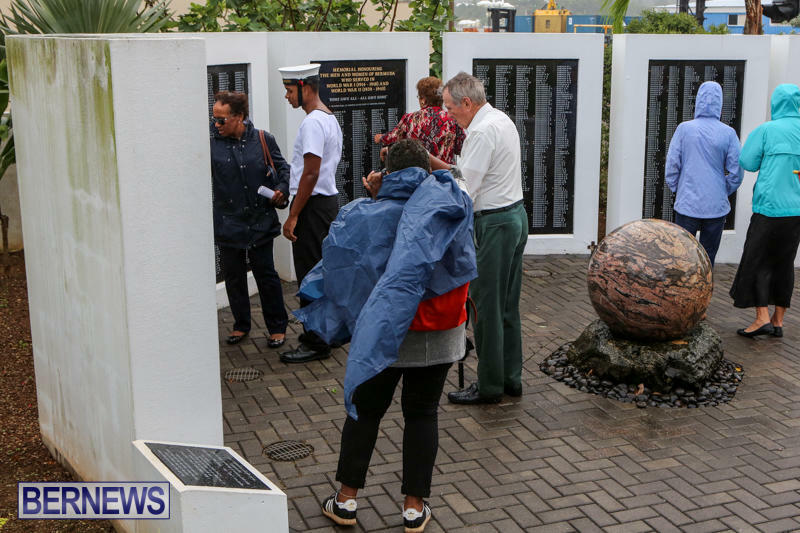 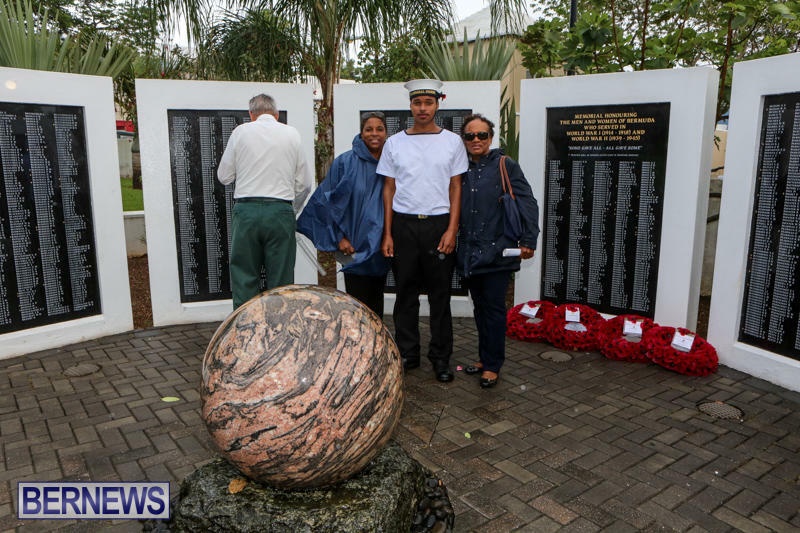 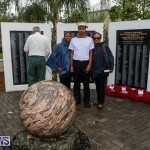 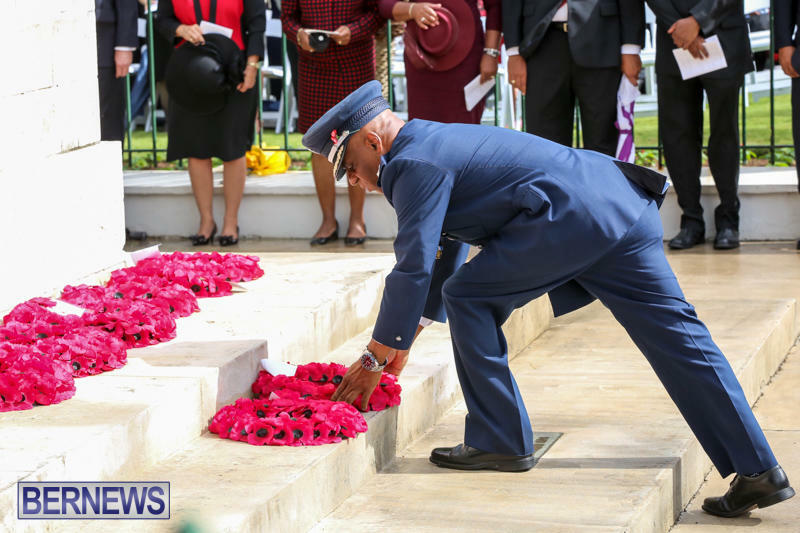 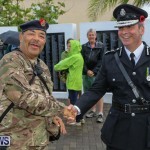 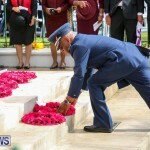 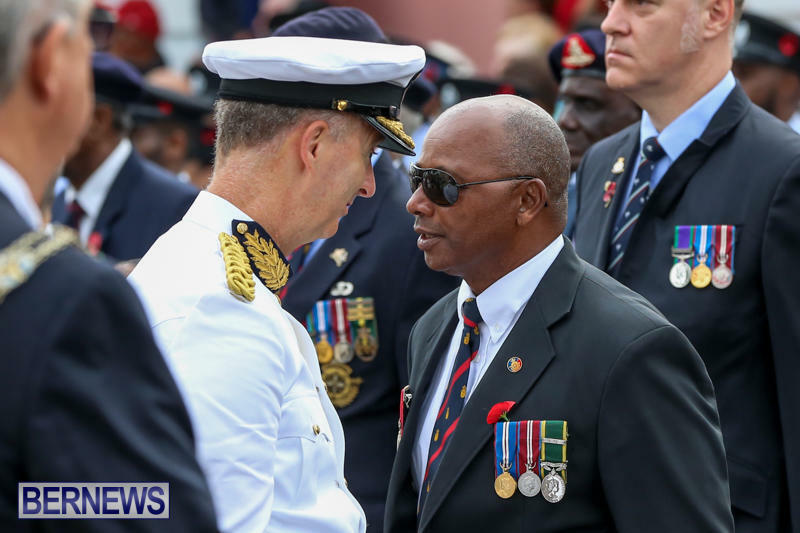 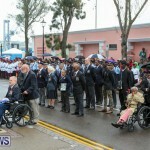 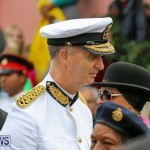 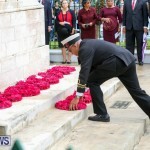 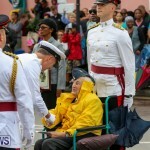 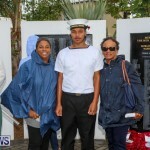 Waters, 65, from Southampton, who served in the then-Bermuda Cadet Corps as a schoolboy in the 1960s, added: “Bermudians have made a difference in the world and it’s important to recognise that fact, whether it’s now or in the past. 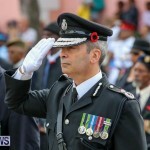 Col. 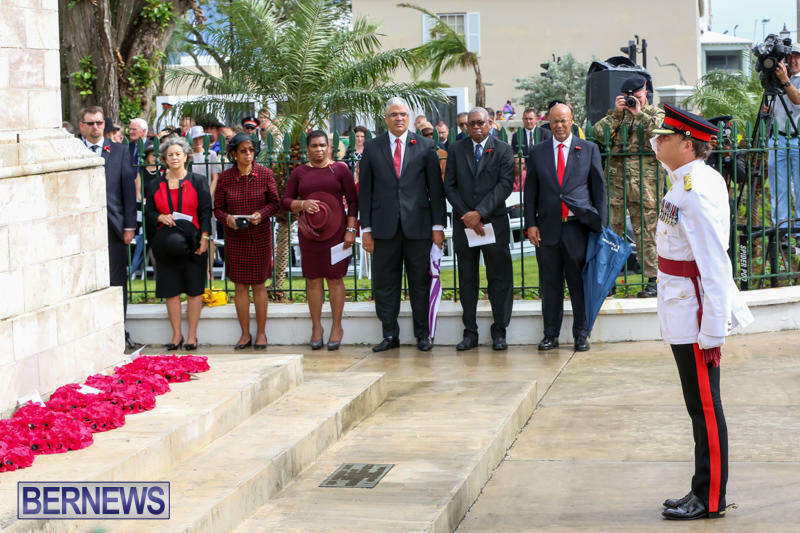 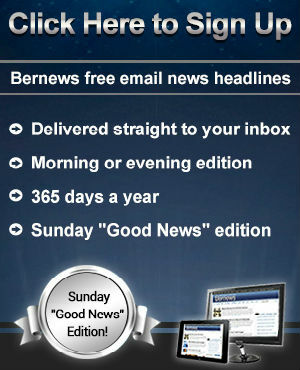 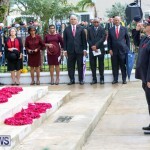 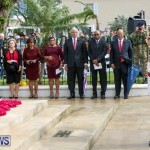 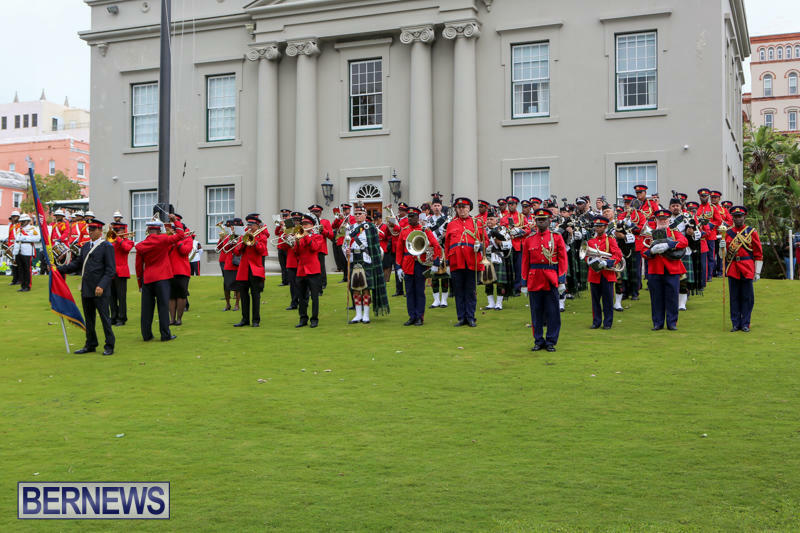 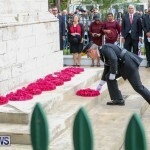 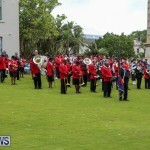 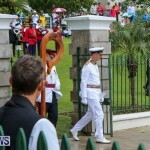 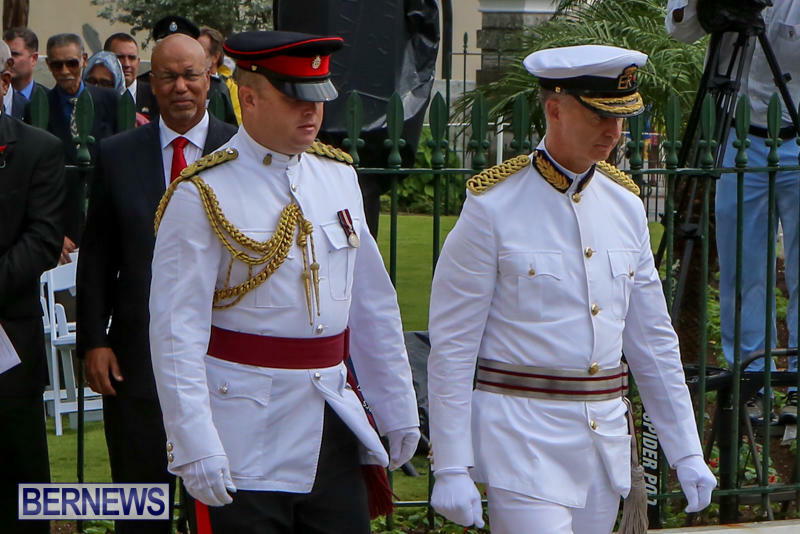 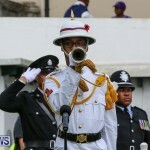 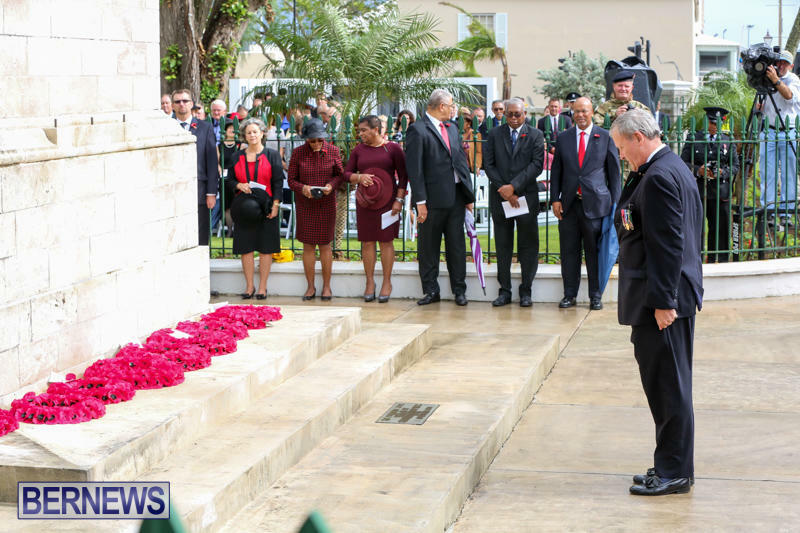 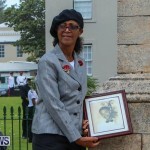 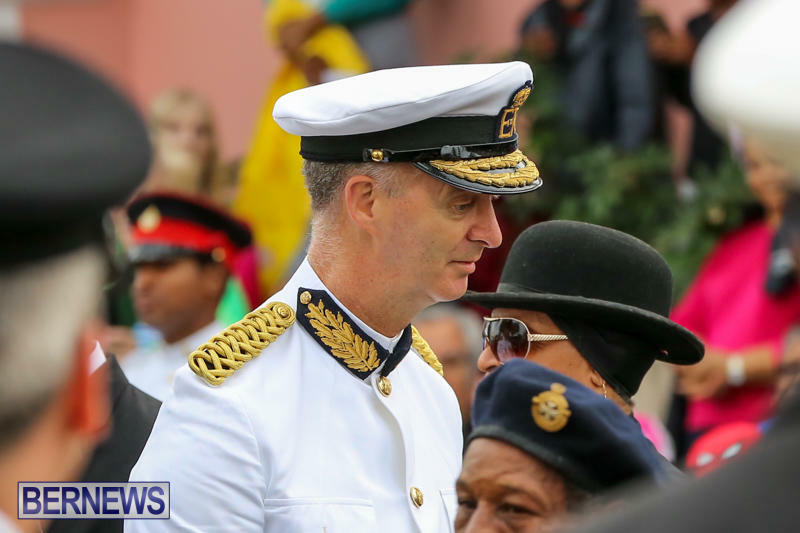 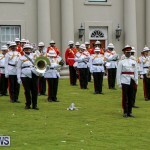 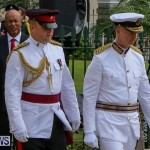 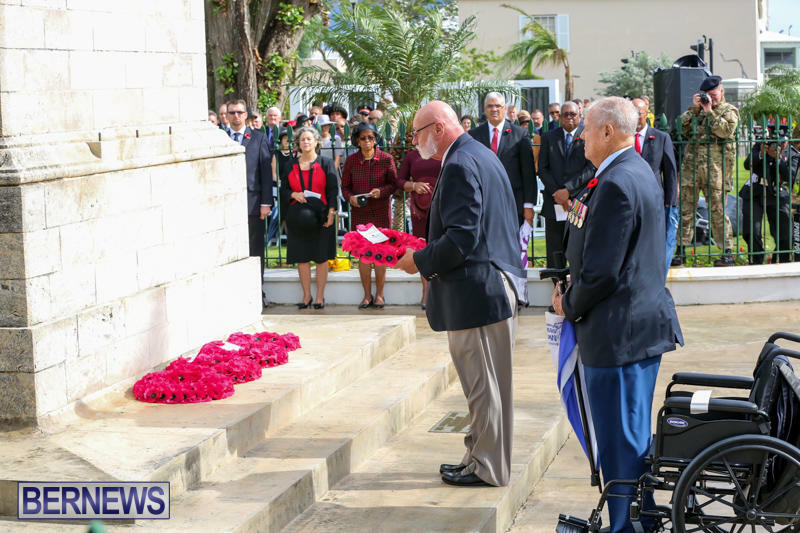 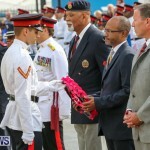 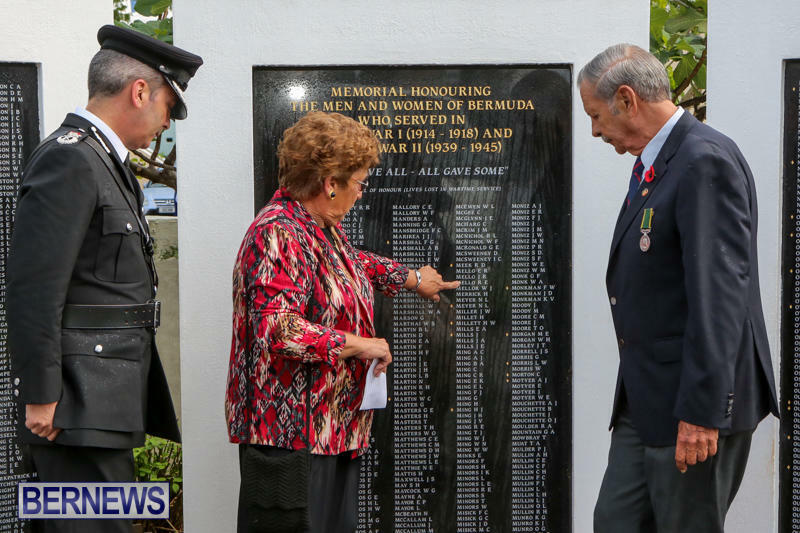 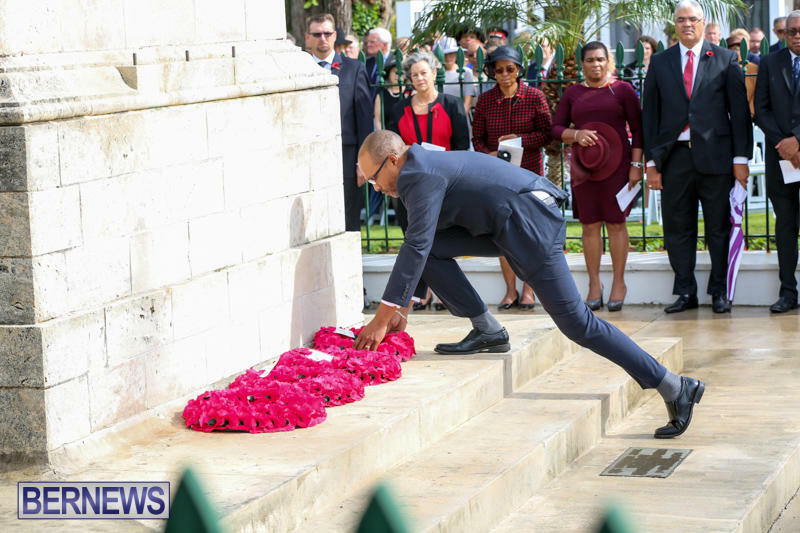 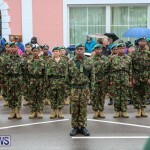 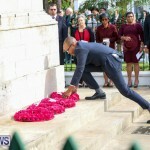 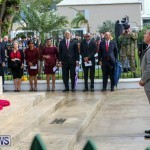 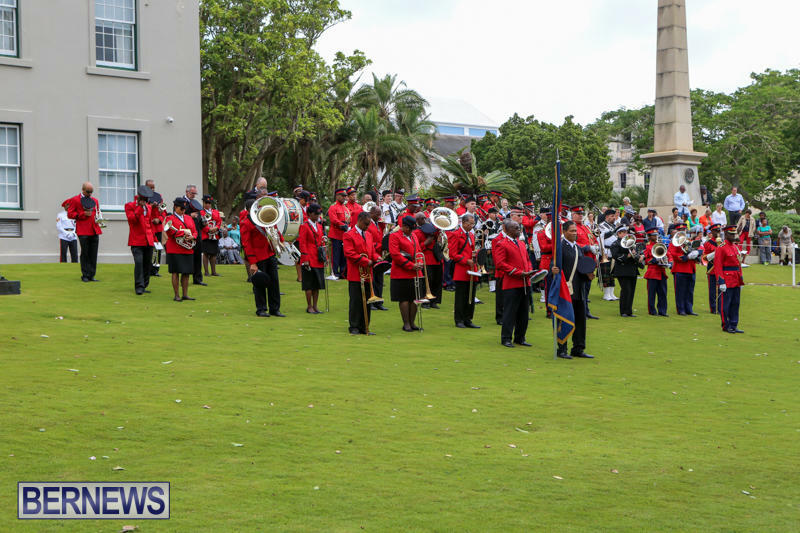 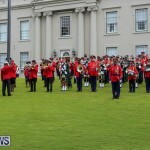 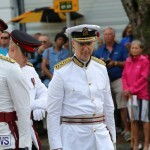 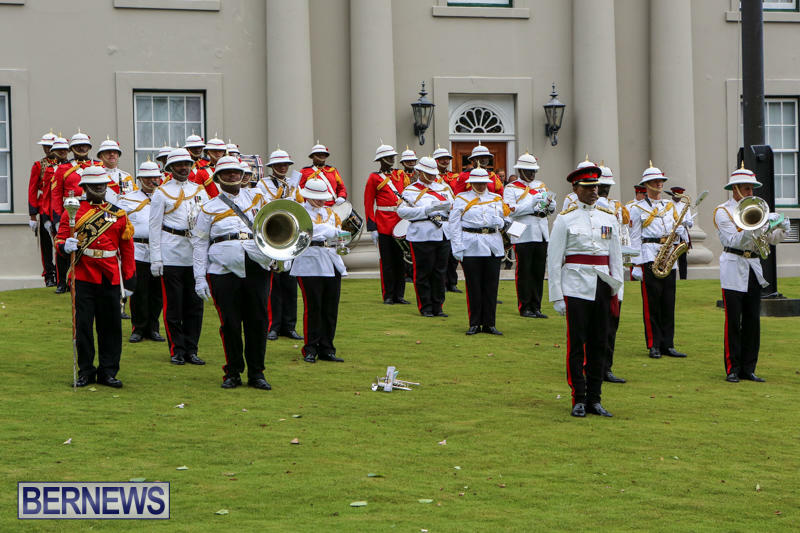 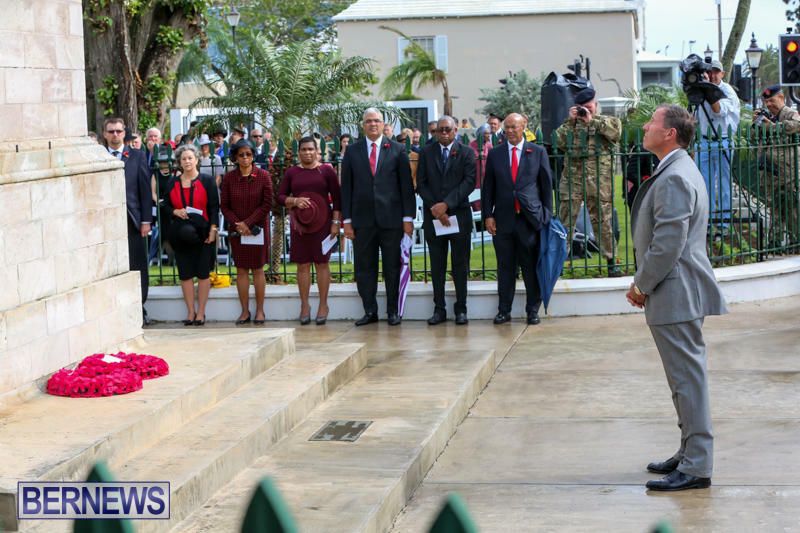 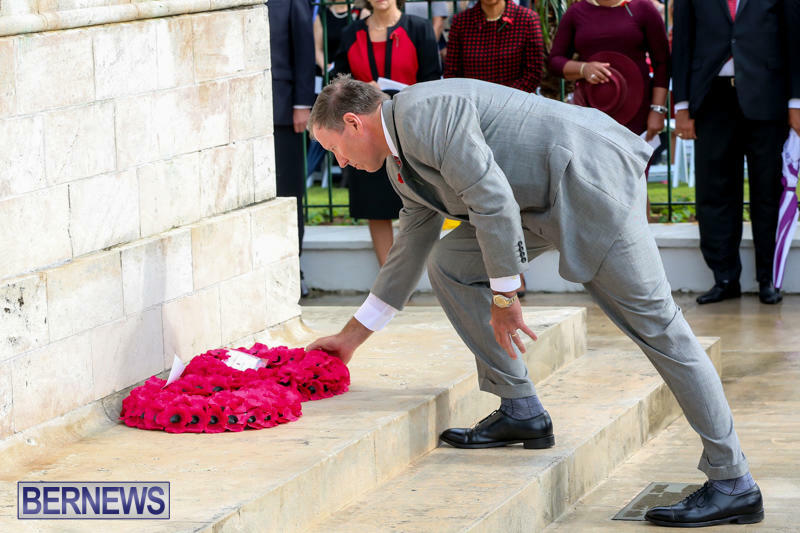 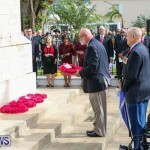 Waters said: “The Regiment has a proud history – the Bermuda Rifles and the Bermuda Militia Artillery had battle honours from both world wars and the Regiment is important to Bermuda. 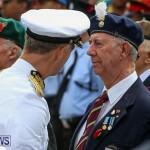 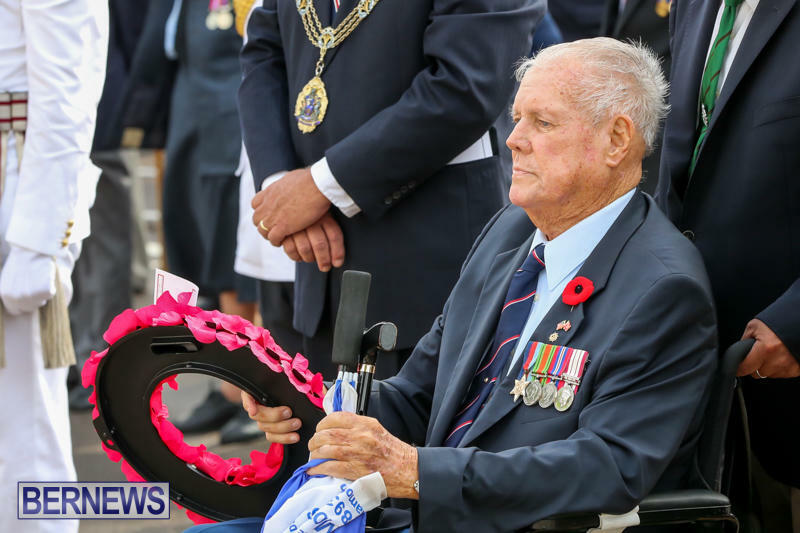 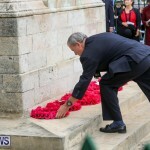 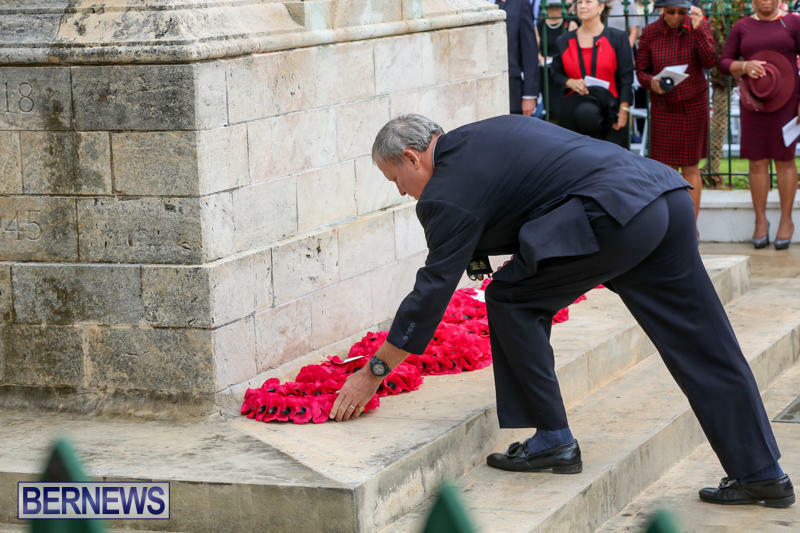 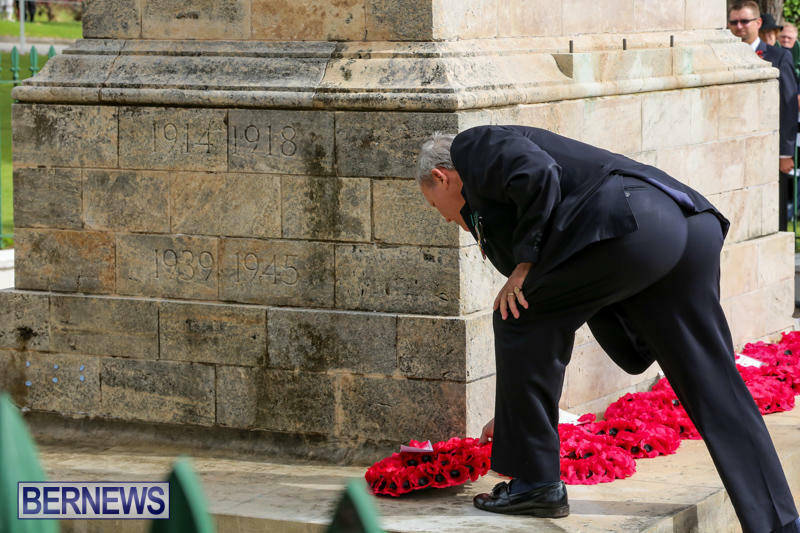 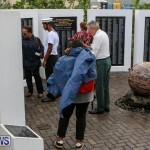 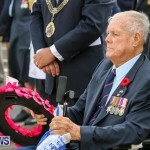 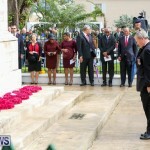 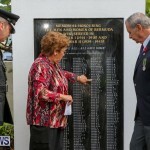 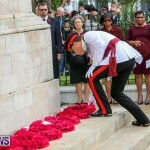 Governor George Fergusson, who led the wreath-laying ceremony, said: “It was an impressive turnout and very good as always to see the veterans. 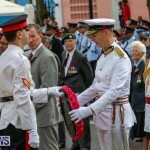 Sadly, one or two I got to know are not here from previous years. 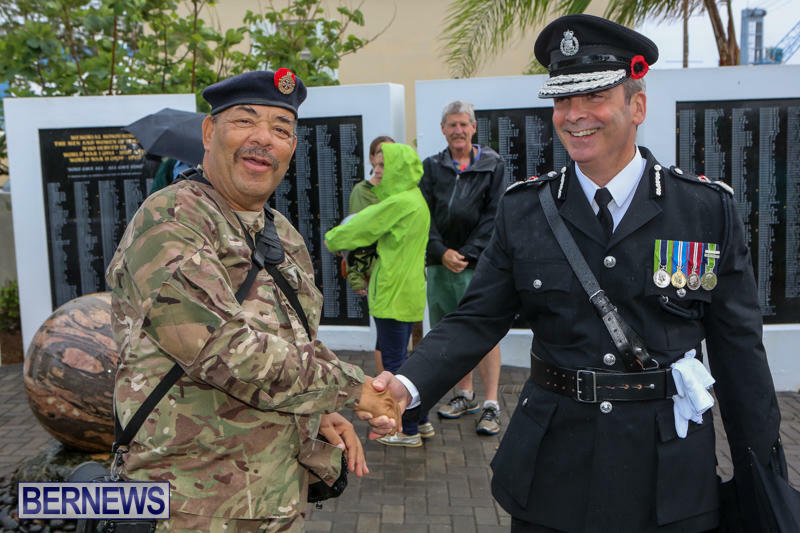 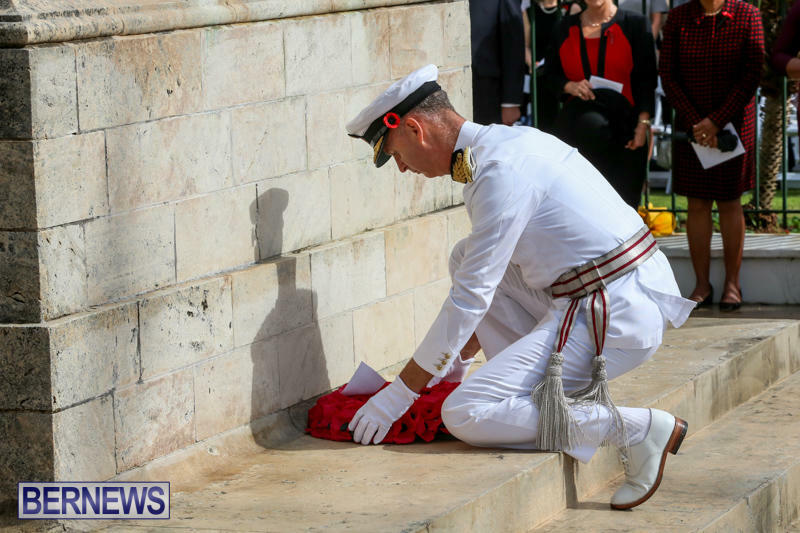 Regiment Commanding Officer Lieutenant Colonel Michael Foster-Brown said: “It’s always a special and moving event in the calendar. 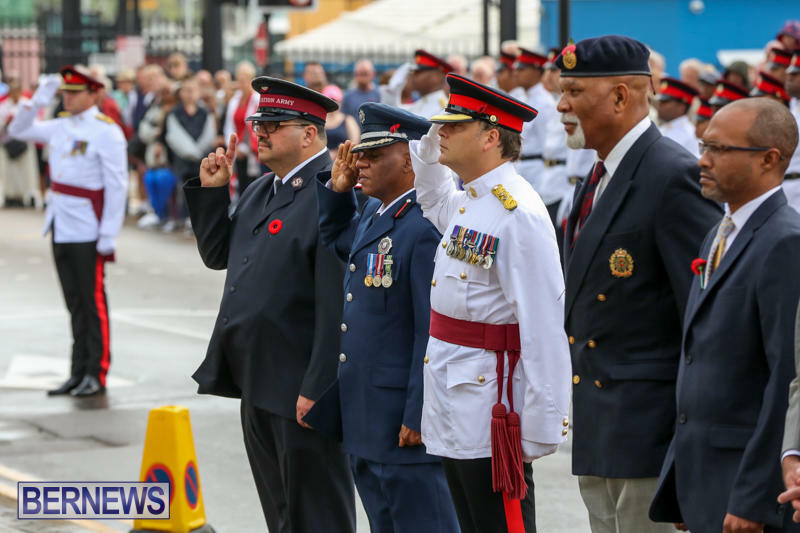 It’s a chance to honour the service of those who gave so much.